to come back to this page. 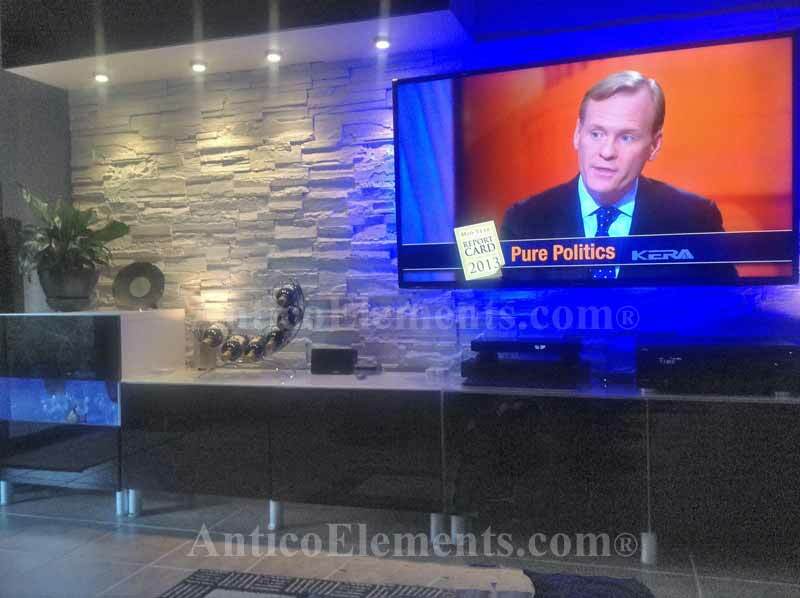 "We love the material and how the installation turned out"
"Bought some panels for my office. 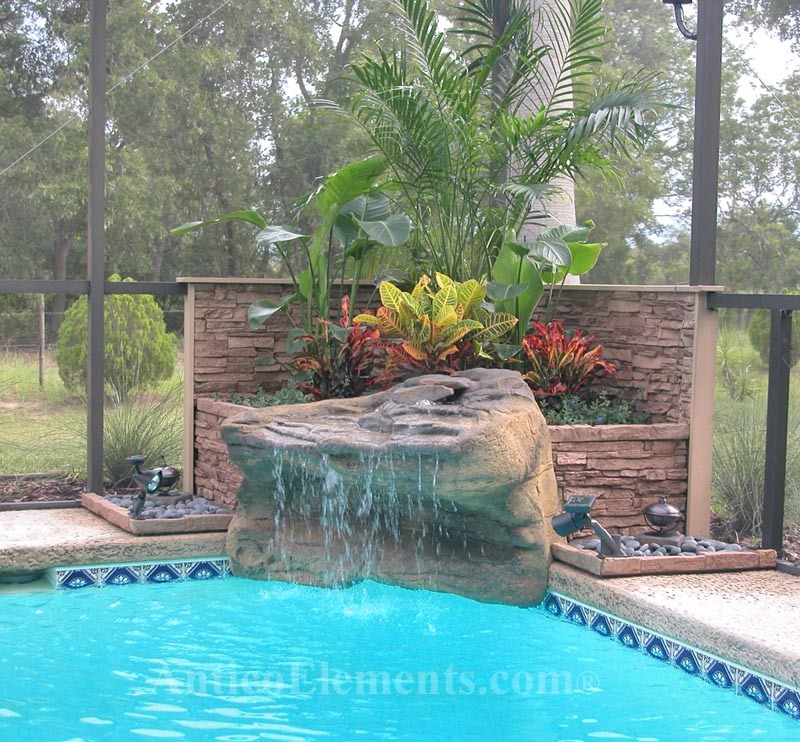 Installation was simple and they look outstanding. 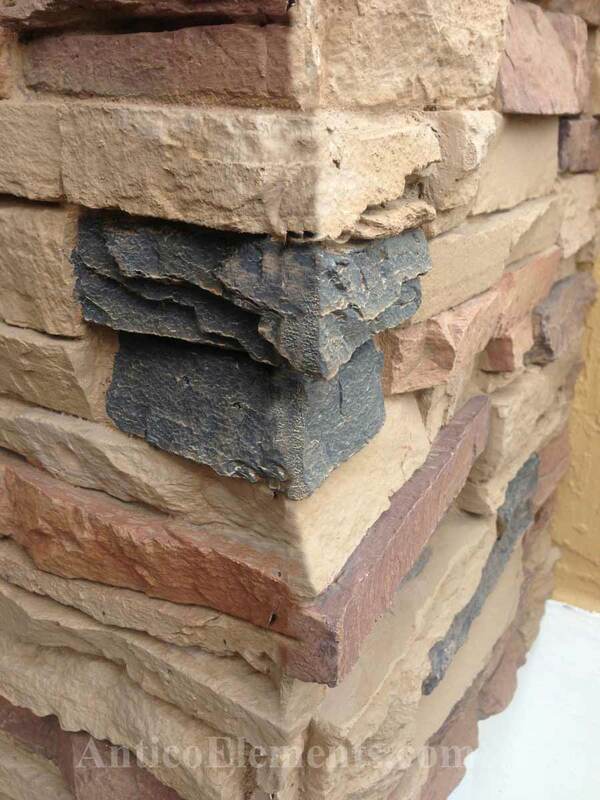 Nobody believes they aren't real stone. Fast shipping and the prices were very fair. Highly recommend Antico." 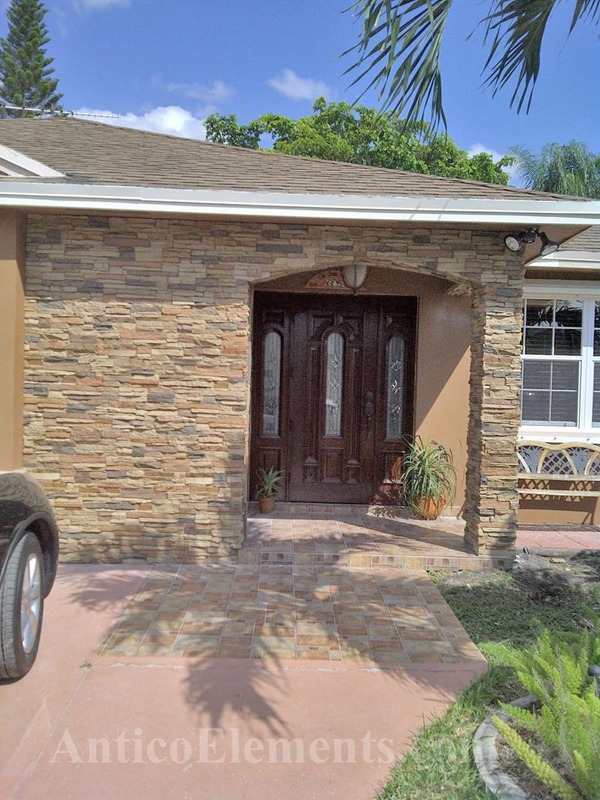 Ryan E. - Miramar, FL. Eugenio E. - Miami, FL. 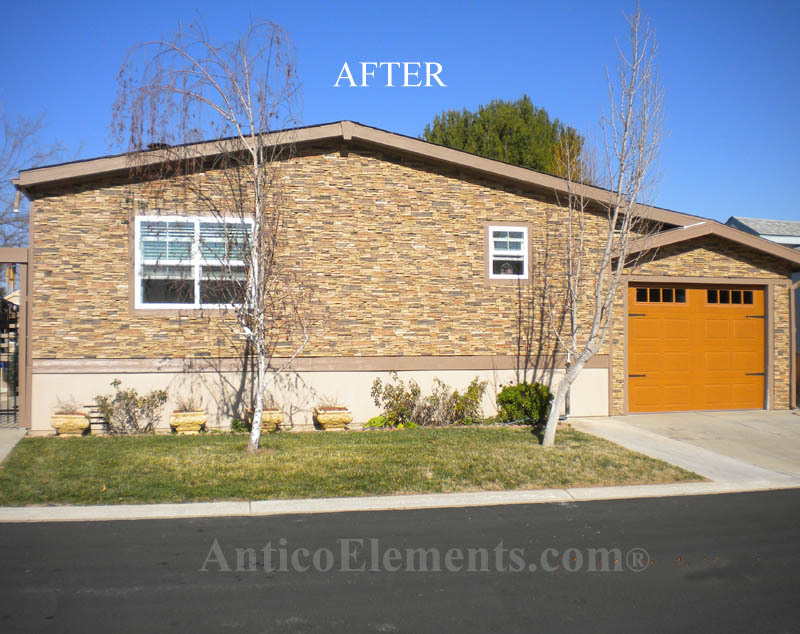 "Our client was absolutely thrilled"
Lorenzo O. - Weston, FL. 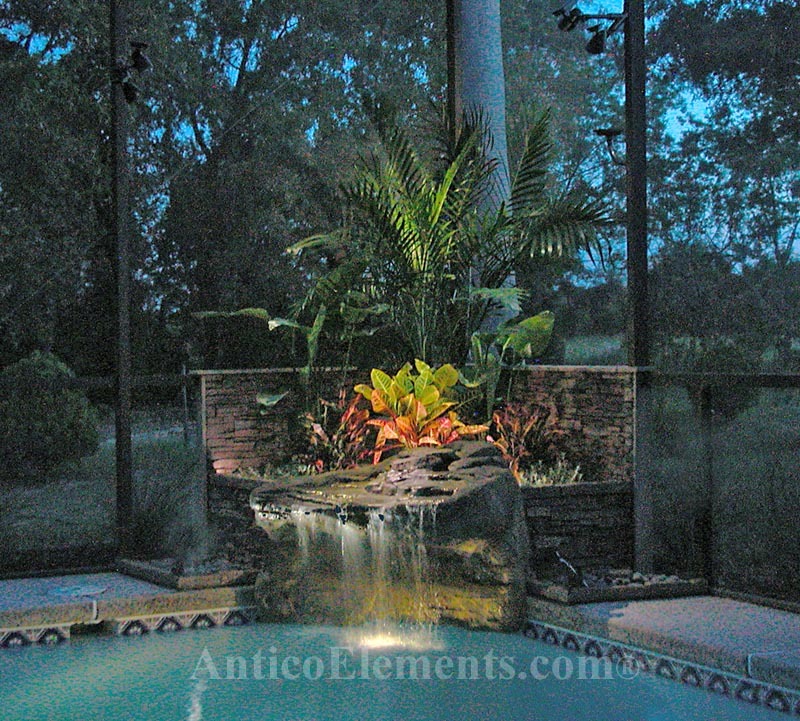 "I want to thank the great folks at antico elements, they were great with us. 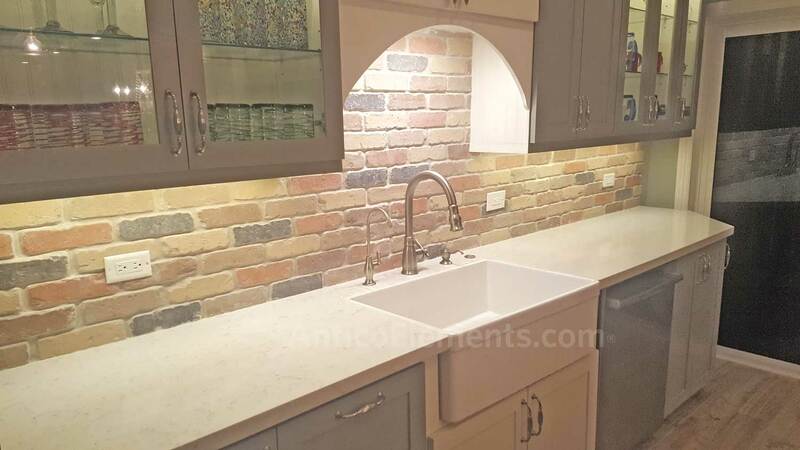 We were worried about ordering faux stone online, without seeing it in person, but we were pleasantly surprised when it arrived. 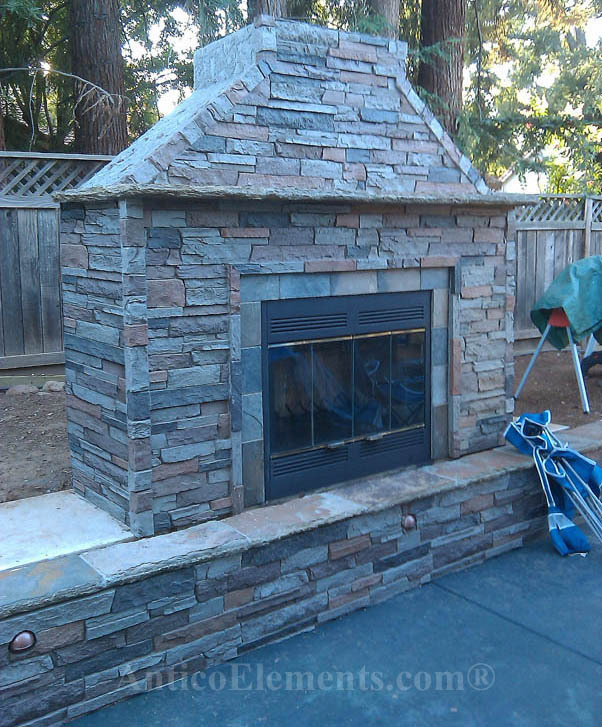 We got the charcoal stacked stone, it is amazing how real it looks, the neighbors all loved it and asked how long it took to lay all those stones, lol. 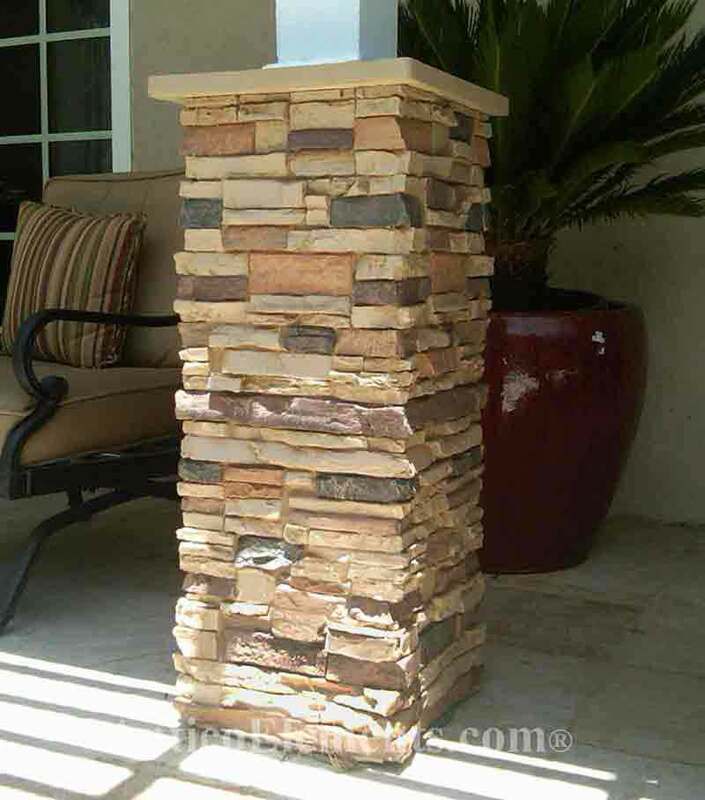 I used to be a contractor and I know that the concrete style stone is very heavy to hang it off of just screws. All in all i love this stone ,and more importantly, so does my wife. Sincerely." 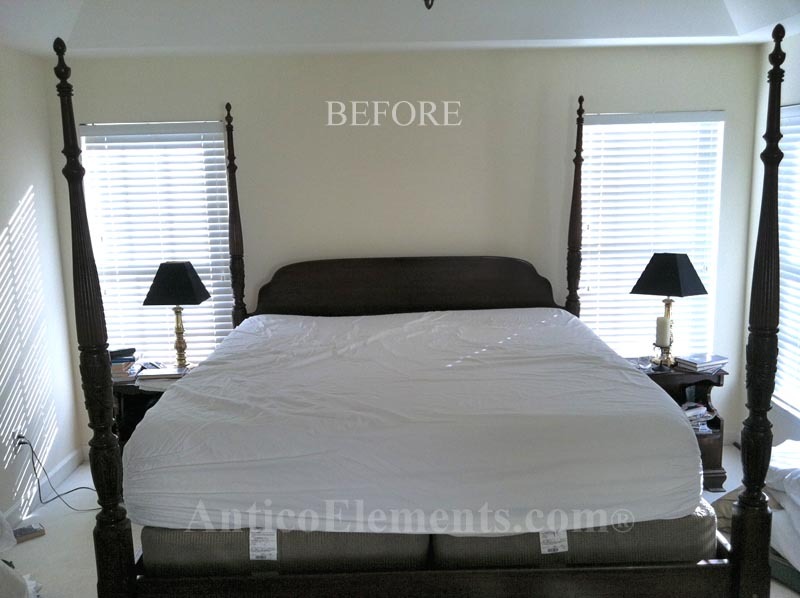 John and Lorraine G. - Indiana, PA.
"Thank you so much for your help from beginning to end on this bedroom project. It was easy to install, although took a little longer than expected, but was first time. 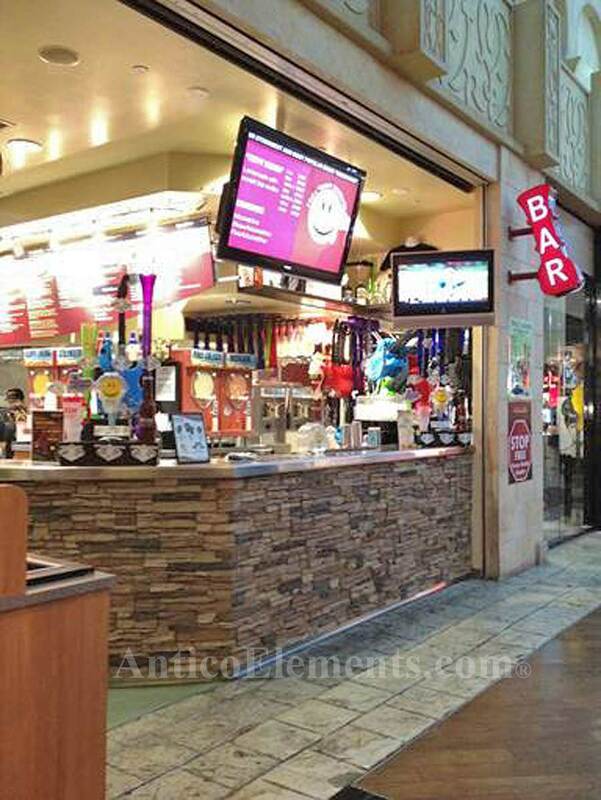 We used the Laguna Cappuccino panels. 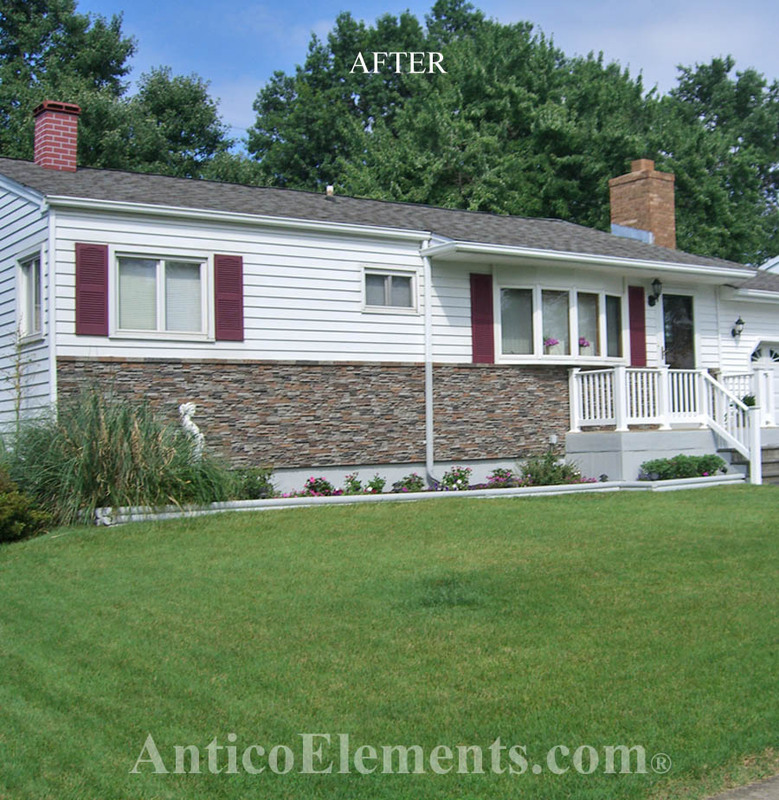 The project turned out beautifully!" Peggy H. - Jasper, AL. 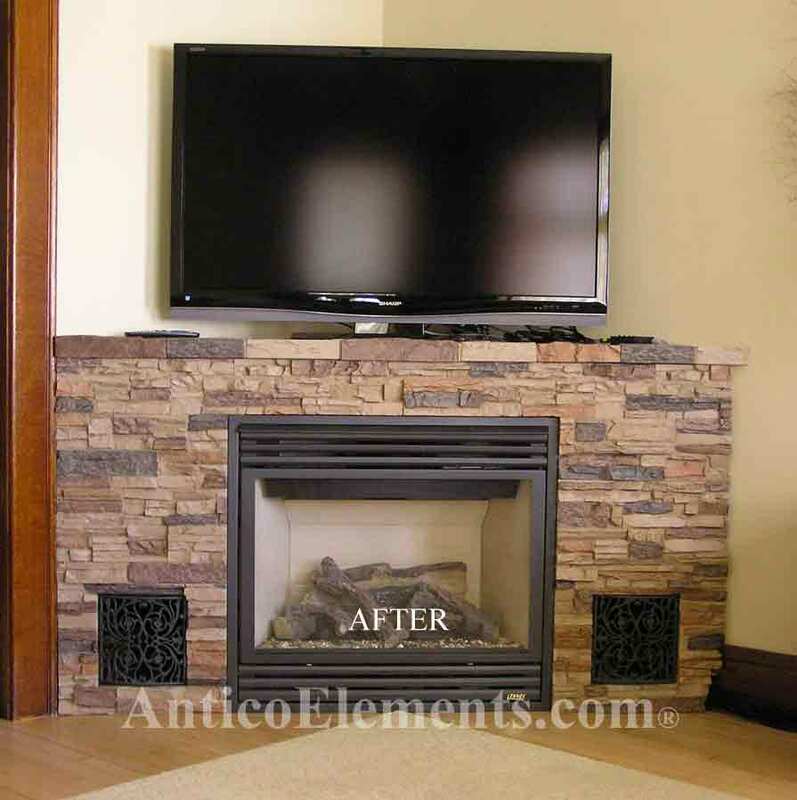 "I just wanted to tell you how satisfied we are with your product. 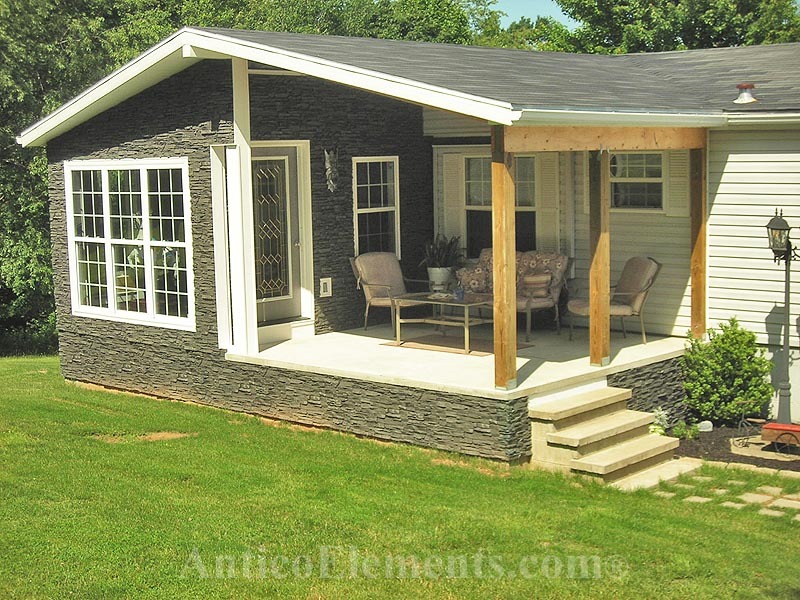 It has totally changed the way our house looks and we’re thinking of installing it on other portions of the house. 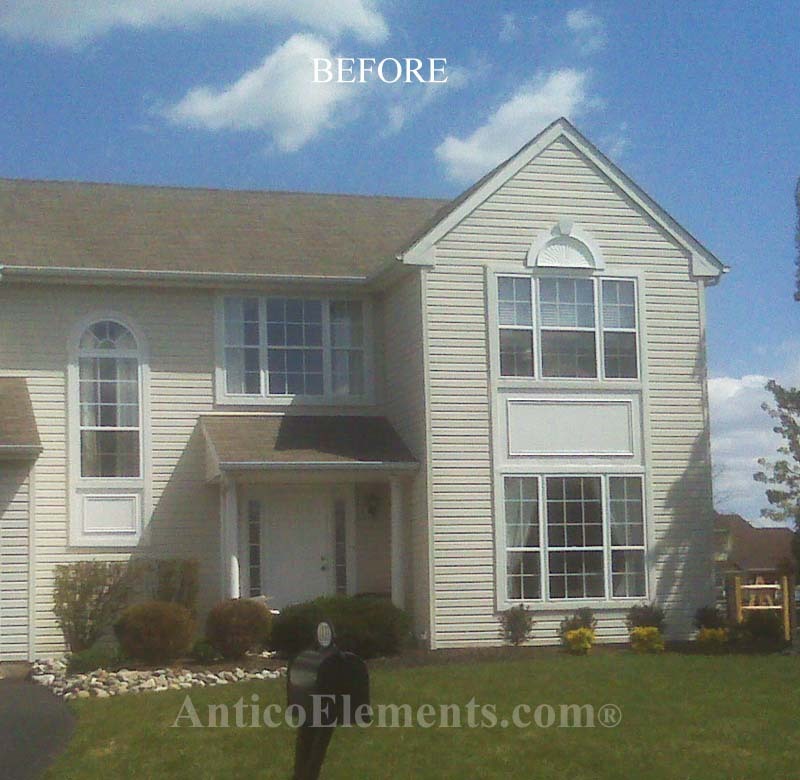 I have included a before and after picture to show how much better the front looks thanks to this product. 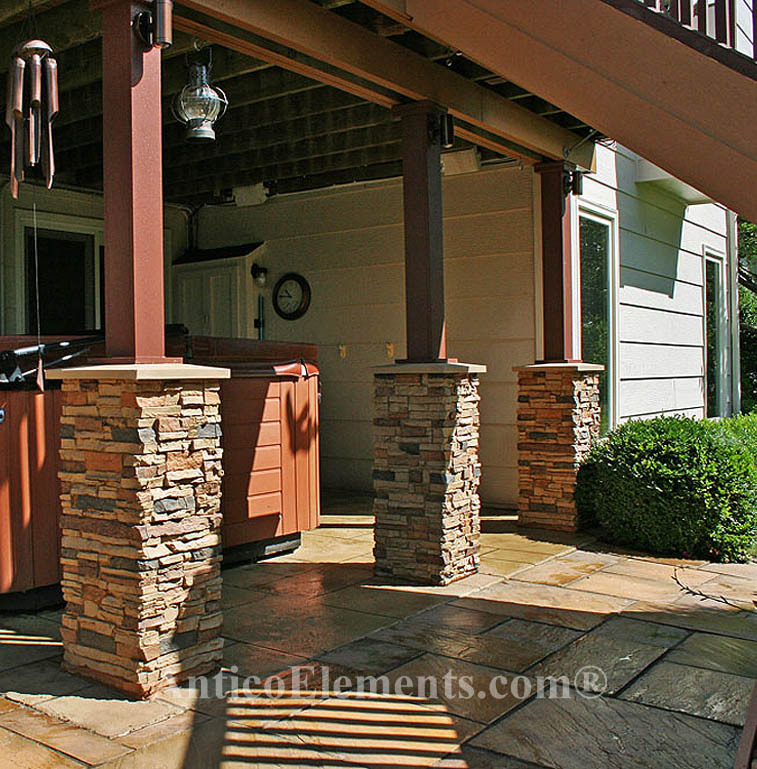 Ordering was easy; it was shipped right to our front door, and installed with no issues. It was very easy to work with. 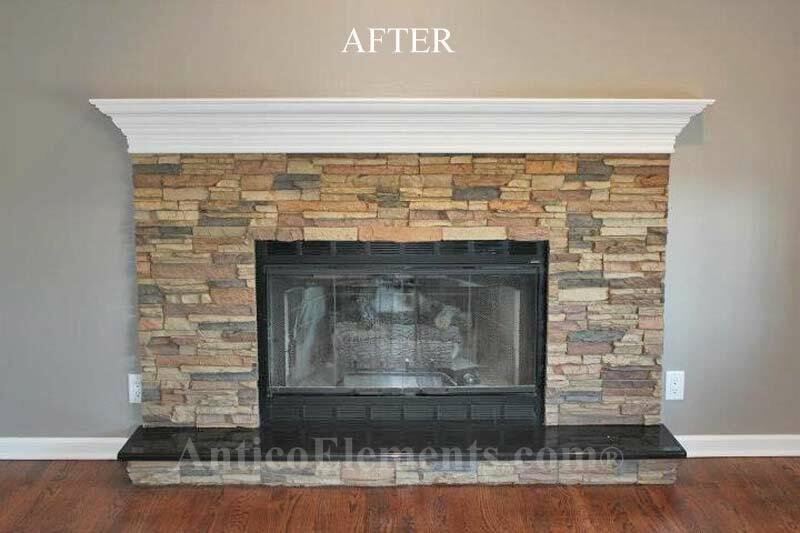 Sincerely"
John F. - Warrington, PA.
"When I finally made it to "fireplace update" on my list of home improvements, I started by shopping around for faux stones to cover the fireplace surround. My Home Depot and Lowes did not carry them, to my surprise, so my search continued a little longer than I would have liked. Some required a minimum purchase larger than what I needed and some just looked awfully fake. 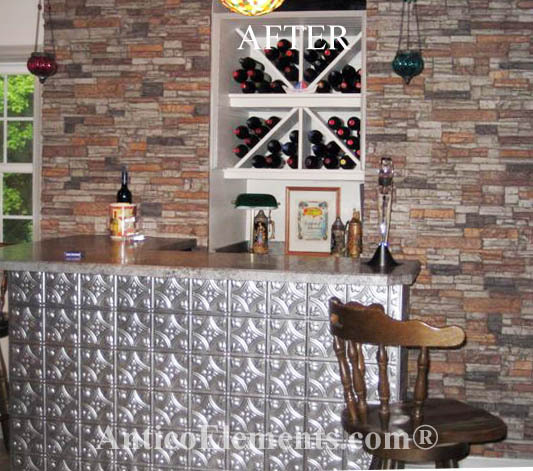 But I found one I liked in a light gray color scheme through Antico Elements. I just needed one 24 x 48 panel, but ordered a sample first to make sure I liked it up close. 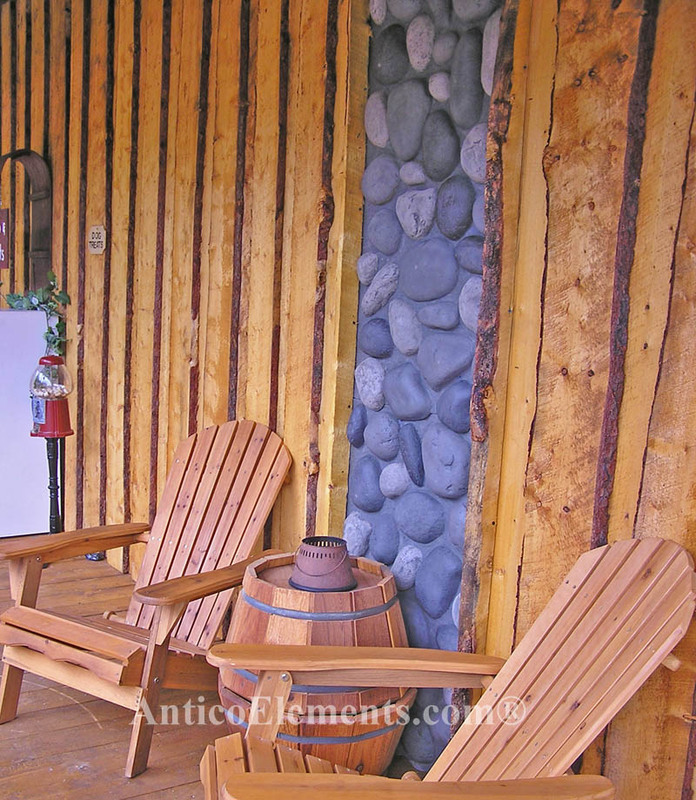 It was pretty realistic looking, cozy and rugged, but light as a feather. It cut easily with a jigsaw or circular saw and left smooth edges. I just measured the surround and cut according to fit, drawing lines on the solid back of the panel." 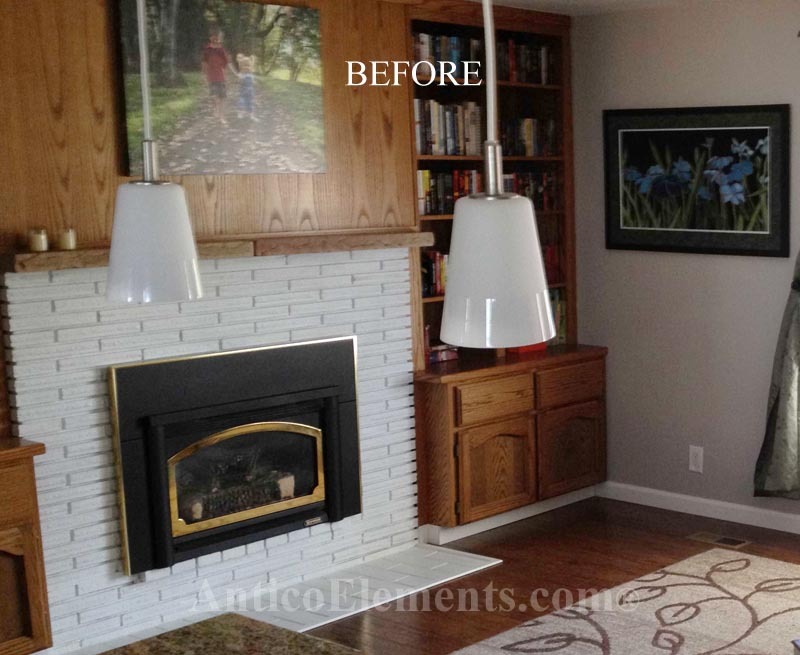 "Thanks it turned out great"
Cassi R.. - Macedonia, IA. 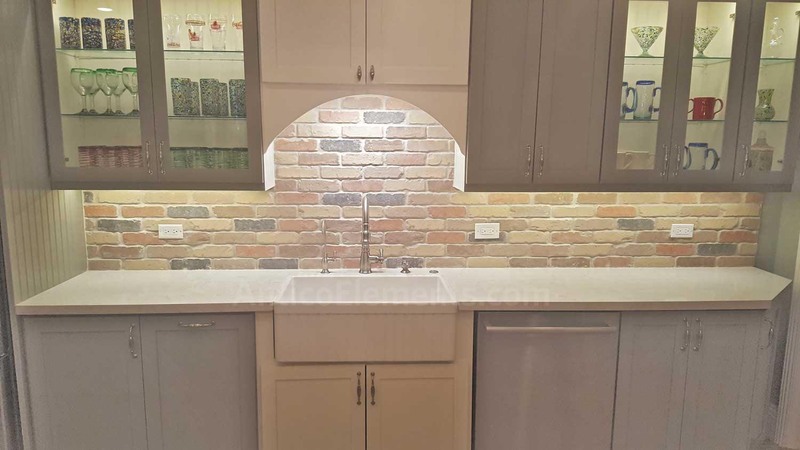 "I have finally completed the project. Your stone looks wonderful. The neighbors cannot believe that it is not real. 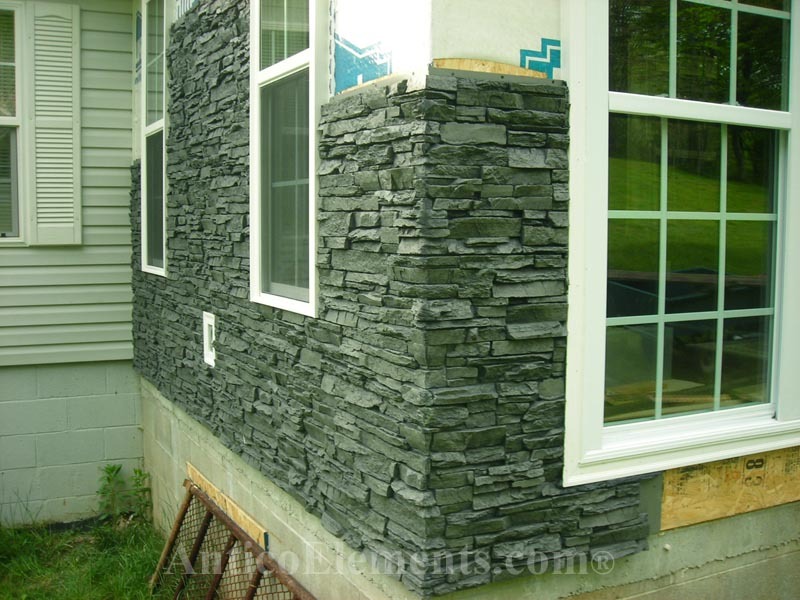 The stone was easy to apply and cut. Thank you." Kimberly M. - Orange, CA. 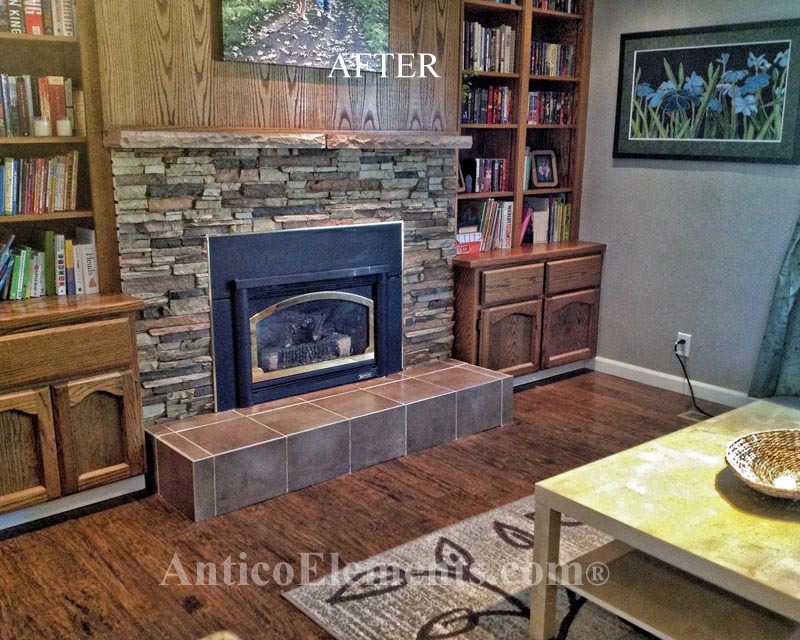 "We just moved in to this house which was built in 1967 and remodeled floor to ceiling- except for the fireplace. 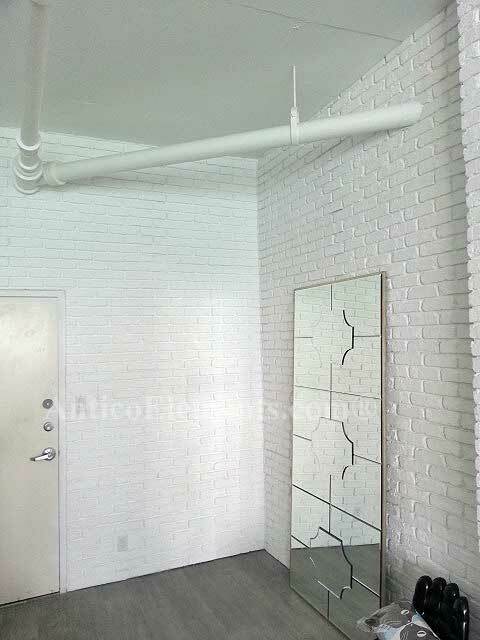 It had painted white bricks, which I HATE! 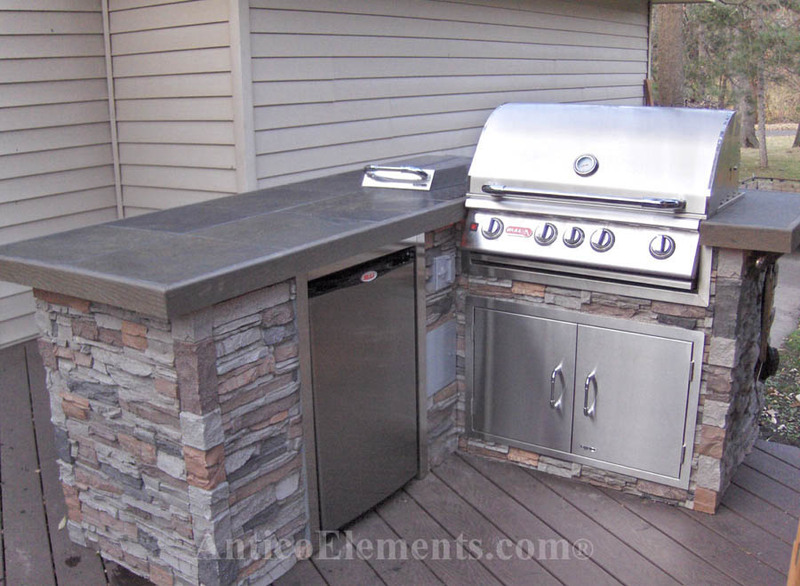 I was thinking I'd have to rip it out and start over with stone, until I found your product. 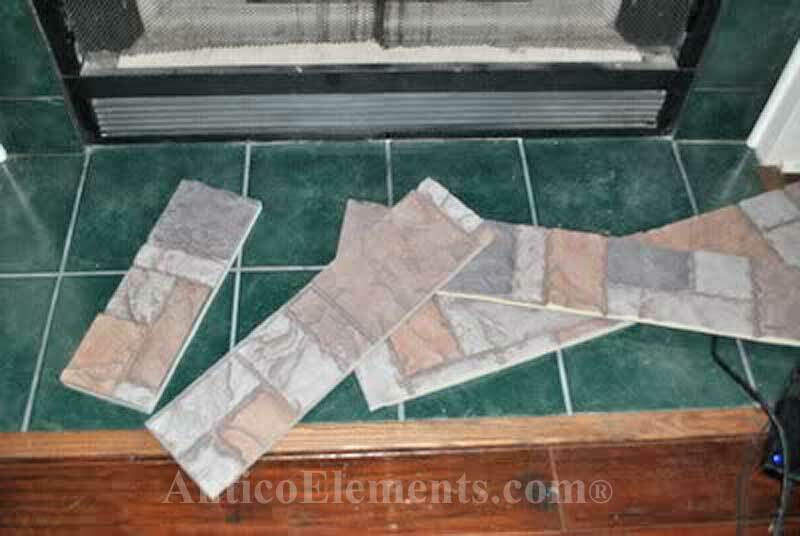 I ordered the sample and decided it was the way to go, mostly because I have very little skill in home improvement. 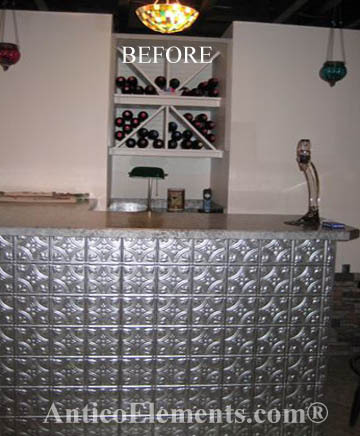 The result brought the room into the modern age, and made if our favorite in the house. Josh D.. - Medford OR. 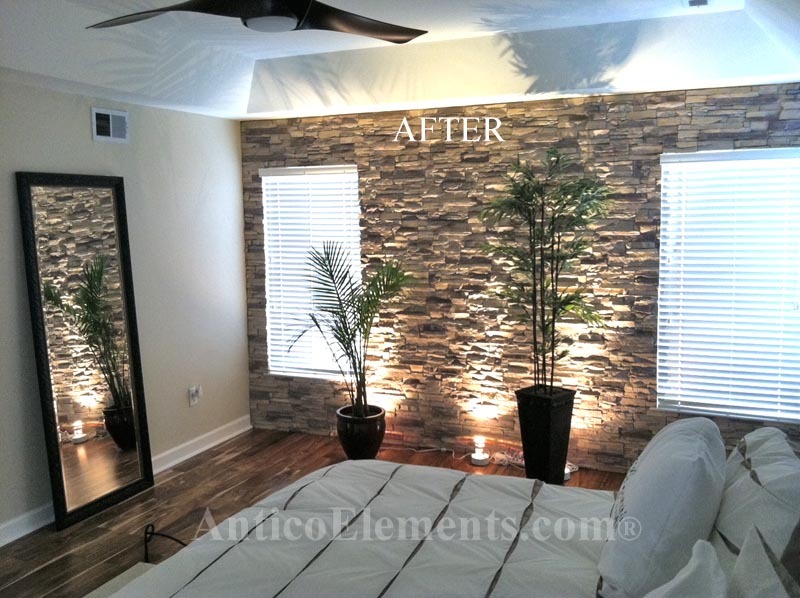 "The product was easy to install the effect it provides to the room is awesome. Mark C. - Frederic, MD. Abdelaxis G. - Miami, FL. 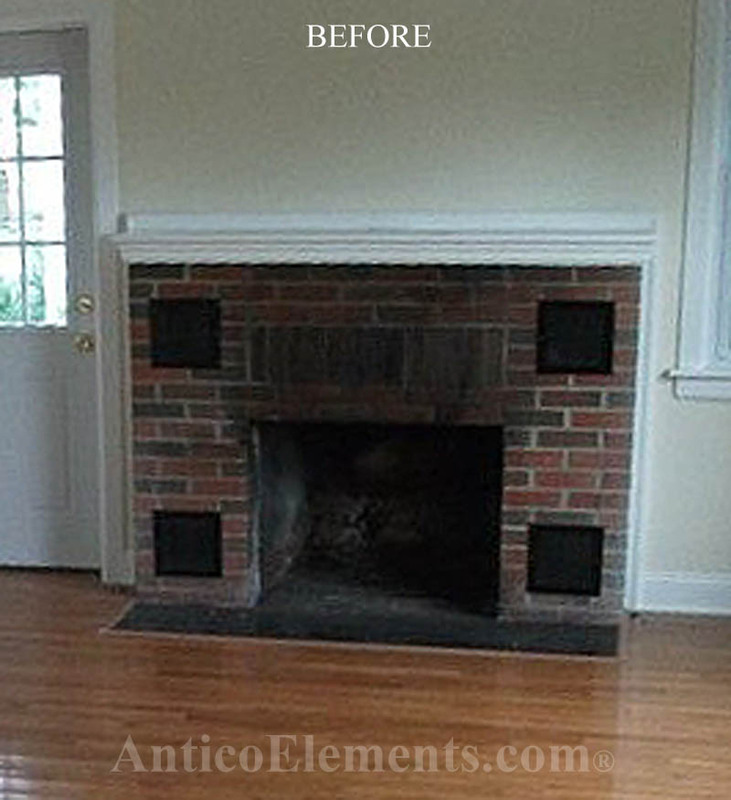 "I just finished my fireplace and can't be more pleased with the result. 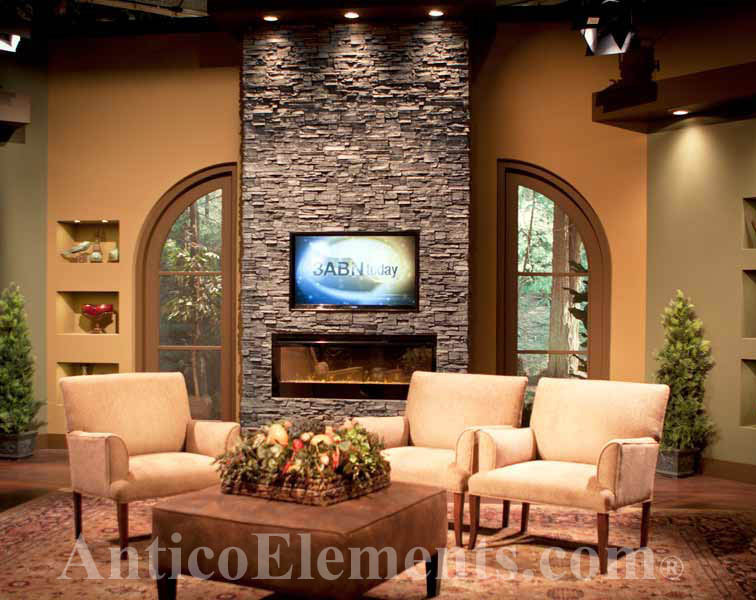 I have worked with real stone in the past and after using Antico Elements faux stone panels I will never go back. 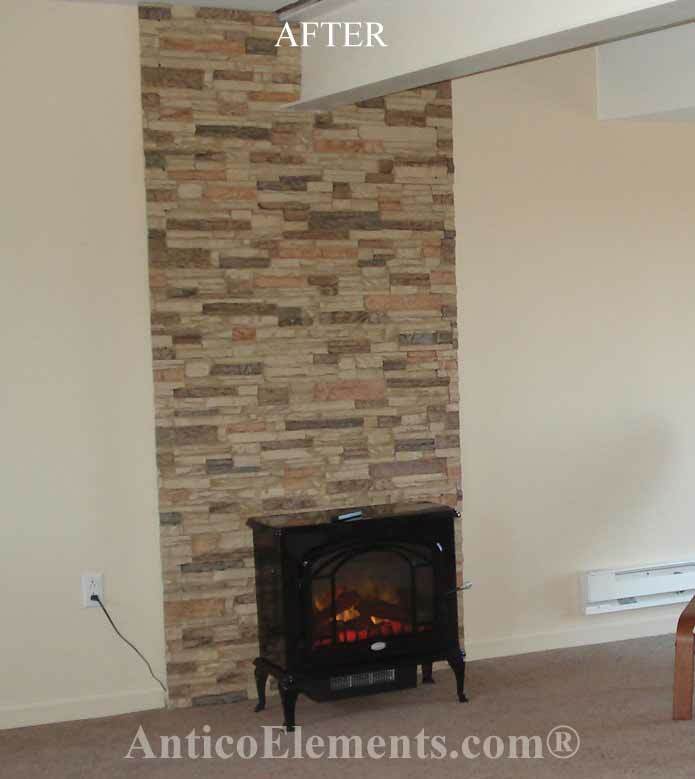 I completed installing the panels on my fireplace, which was 18 feet high by 6 feet wide in less than 3 hours. 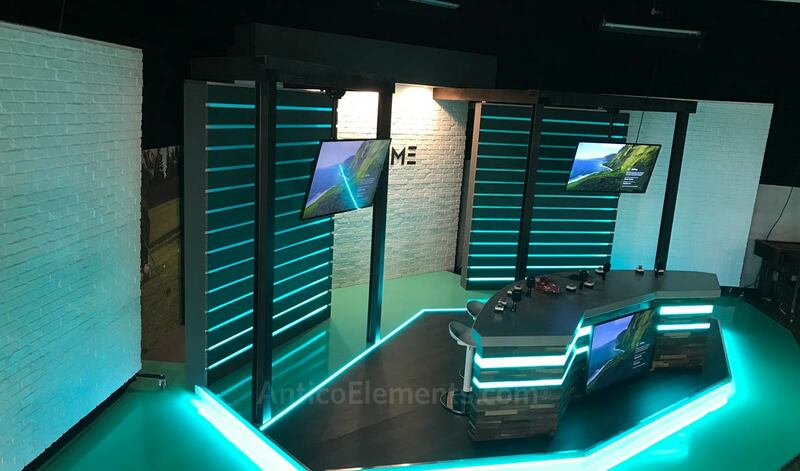 The panels were extremely easy to work with, very light weight, and best of all they look fantastic! 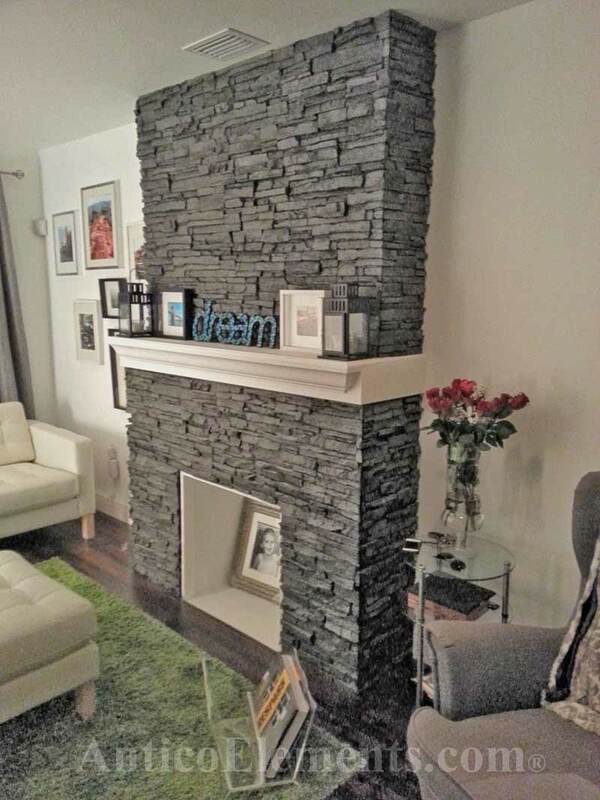 Everyone that has come over has commented on how good my fireplace looks and how real the stone looks. 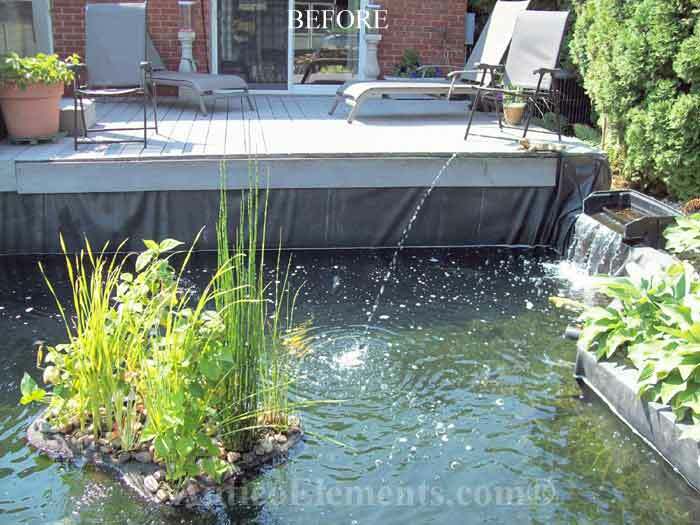 I would 100% use this product again and would definitely recommend it"
Nathan B. - Westlake, OH. John P. - Templeton, CA. "Oh my goodness! Thank you SO MUCH!" Andrea T. - Las Vegas, NV. 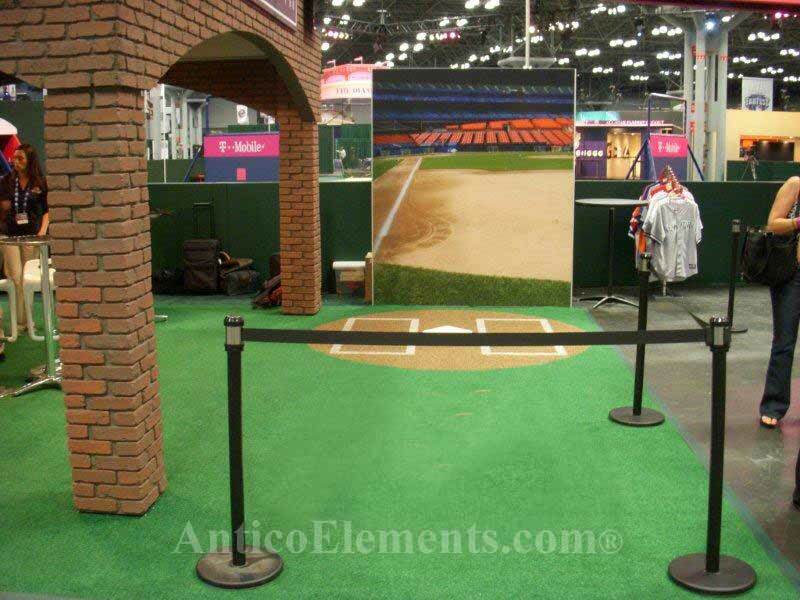 "As soon as we were done the set I received samples that I ordered from other vendors. 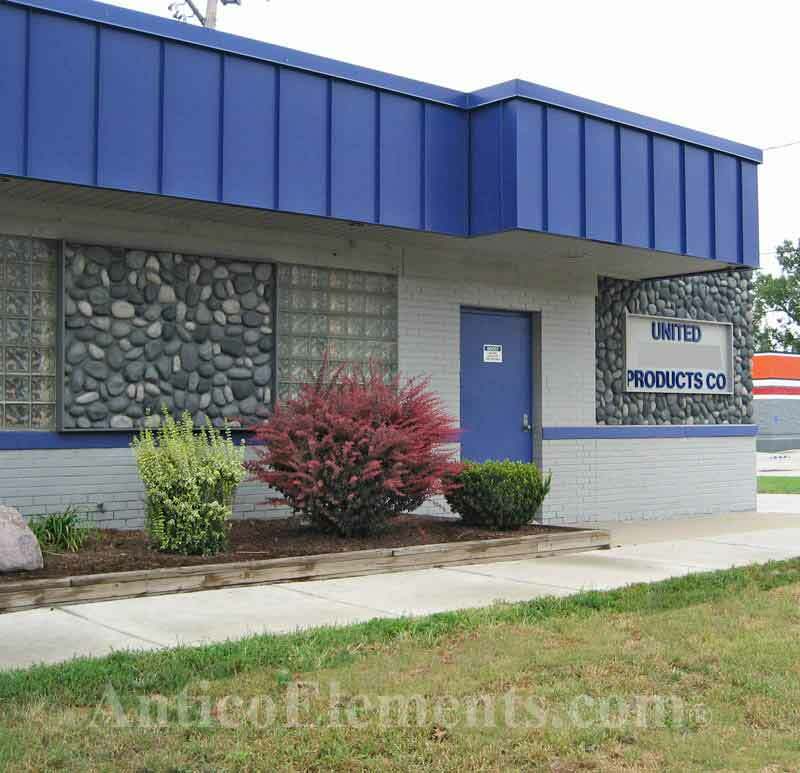 Not only were you guys very prompt in your service but you also had the superior product. I appreciate the time you guys took to send me multiple samples and all the time you guys spent with me on the phone answering questions and we really liked how strong the panels are. I really enjoyed using them and I have also recommended you guys to friends." 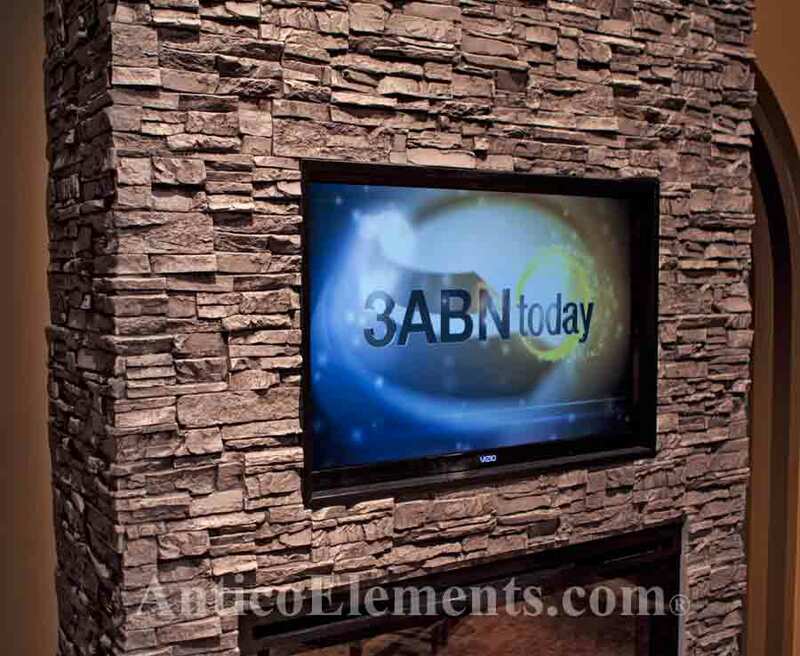 Kyle W. - 3ABN Broacasting. 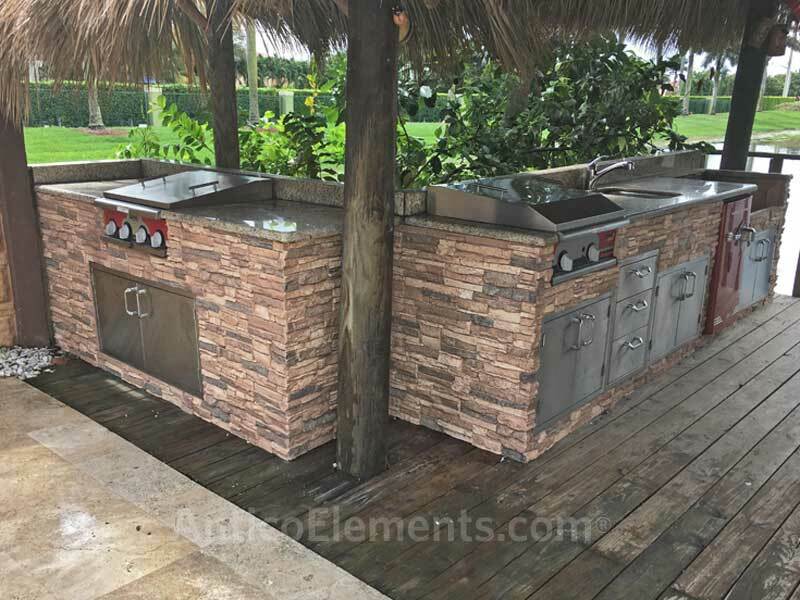 "Thank You for your excellent service & product! 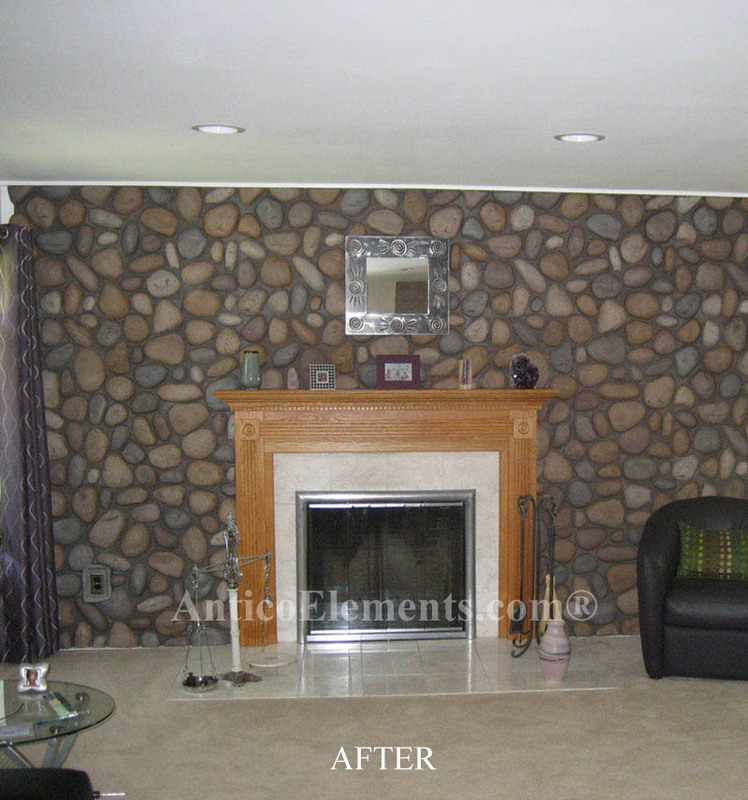 Attached is a photo of the wall treatment -it was everything we had hoped for!... we love it and look forward to using your products again! 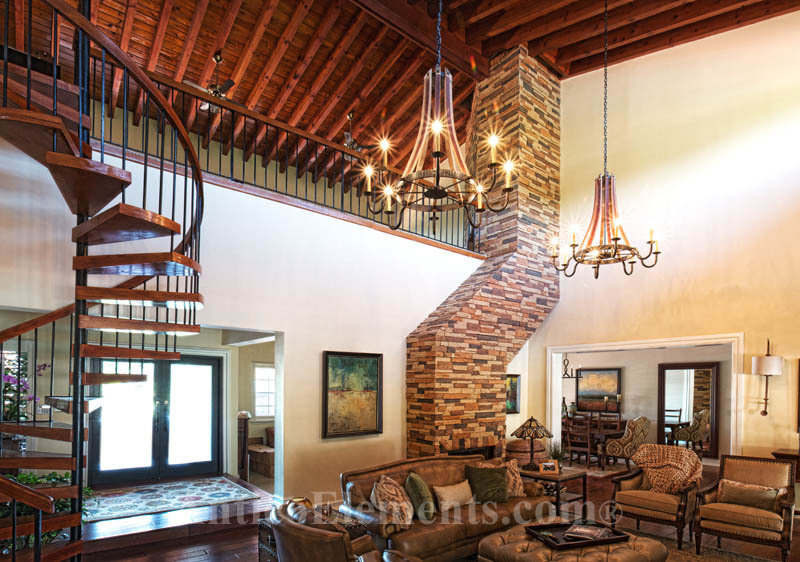 Thanks again"
Wendy C. - Glandale AZ. 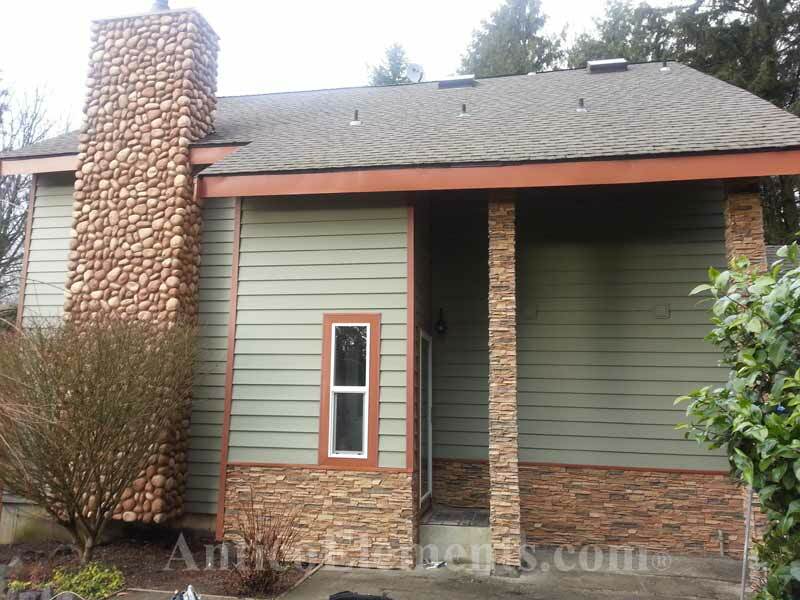 "I am very happy with your rock panels and so glad we went with your company, I cannot say enough about the quality of the panels, they were easy to install and look so much like real rock. 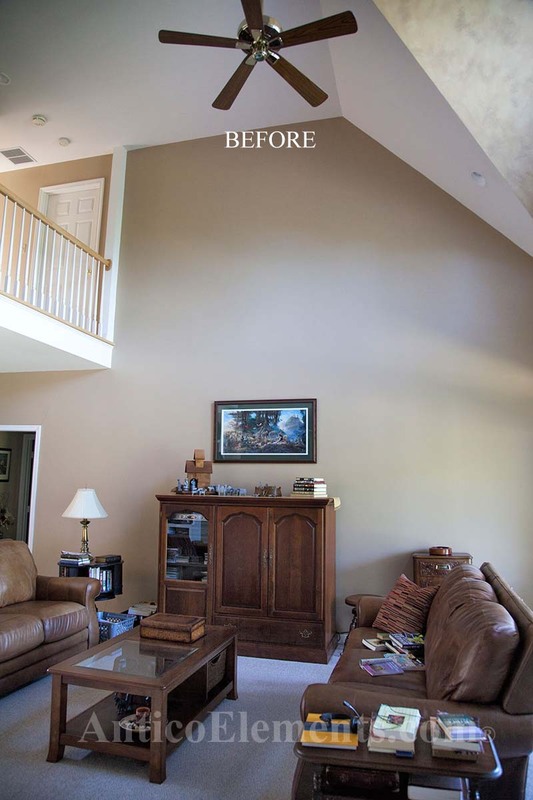 Our friends could not tell the difference until we told them and they were amazed I plan on doing a wall in the living room now." 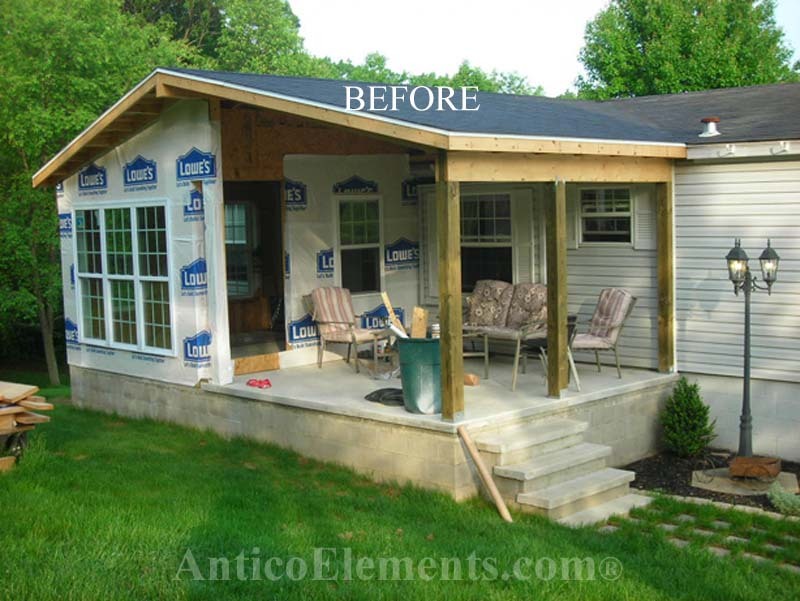 Sherwin C. - Monticello KY.
"The project went well. I will be measuring for more projects very soon. Thank you"
John O. - Suisan, CA. 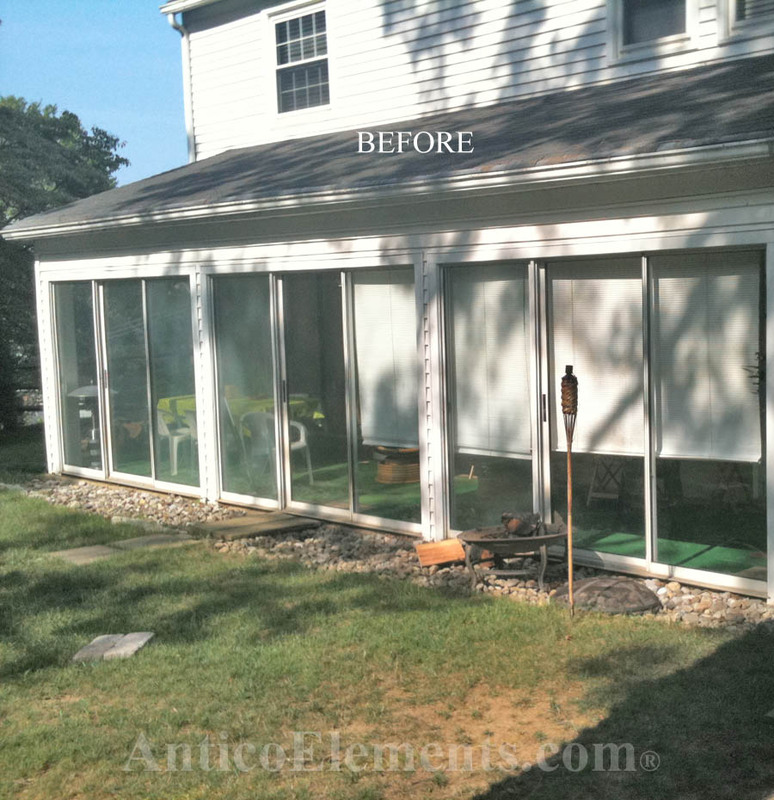 "Your products looked fantastic and were very easy to work with and fit!! 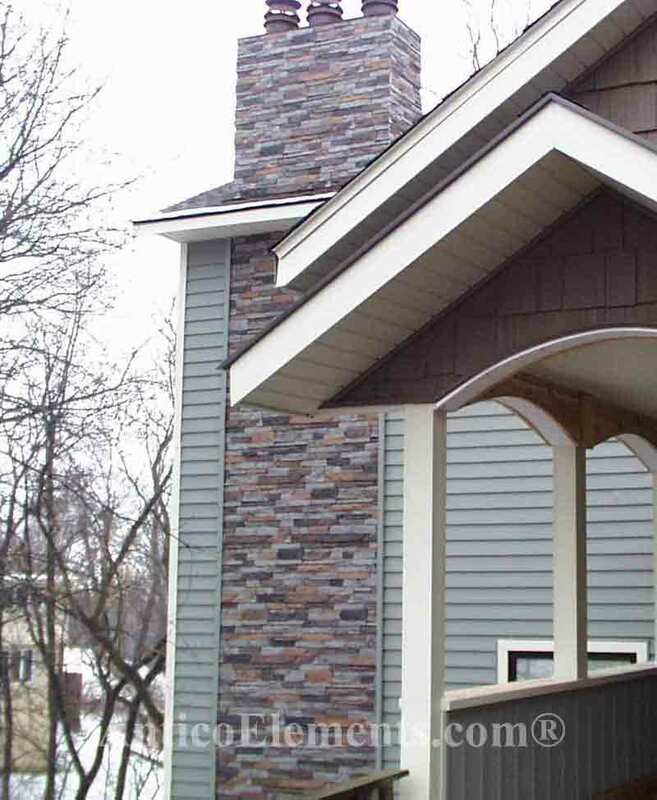 I will be ordering some additional outside corner trim to cover the end boards. I will send the photos in several batches. Please let me know you received these in good order. Keith M. - Leesburg, FL. "I am beyond thrilled with this product! I am a photographer and Christmas is my busiest season. 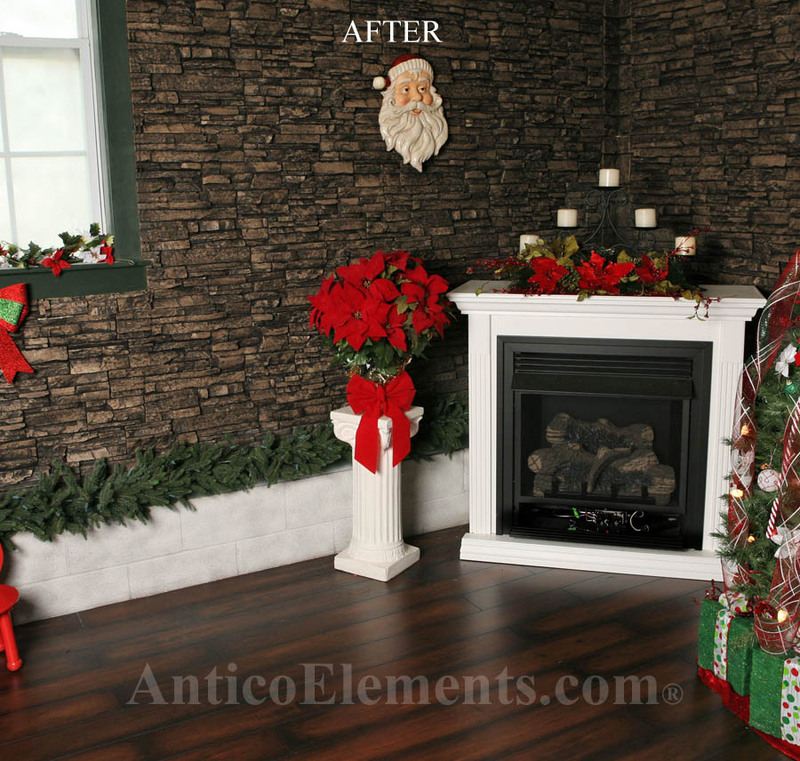 I needed a realistic, home and warm feeling background that was different and unique and I found it with this product. 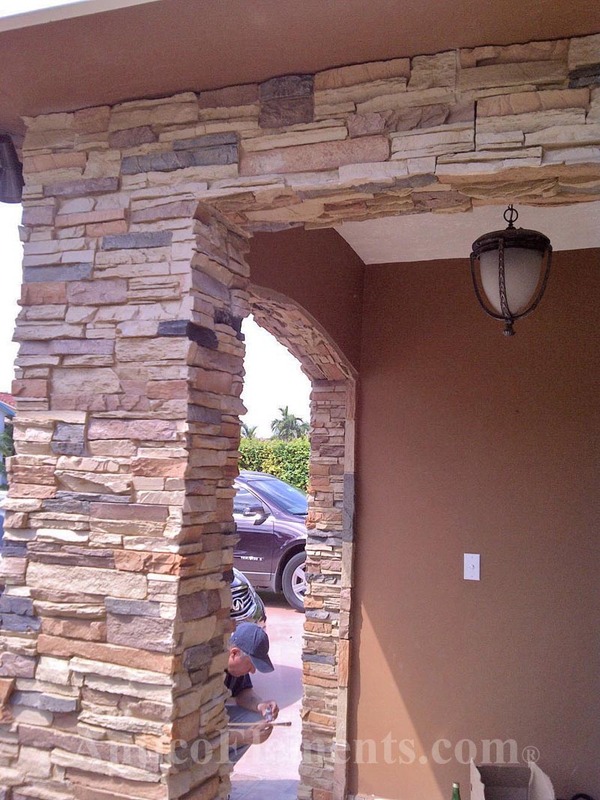 I contemplated individual stone and mortar installation, but this is so much easier and faster and looks great. I’ve had so many compliments on it and it looks great in the final portrait! Will definitely use again." Christian C. - Bowling Green, KY.
"I had been putting this job off for several months as I expected this to be a major undertaking. 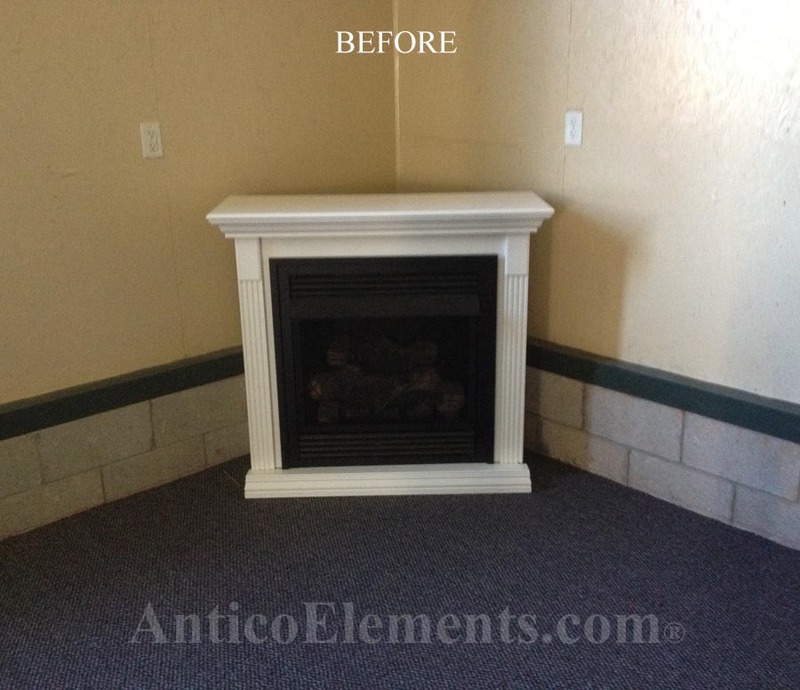 With minimal tools (a saw, file, screw gun, level and caulk) I was able to produce this beautiful fire place. 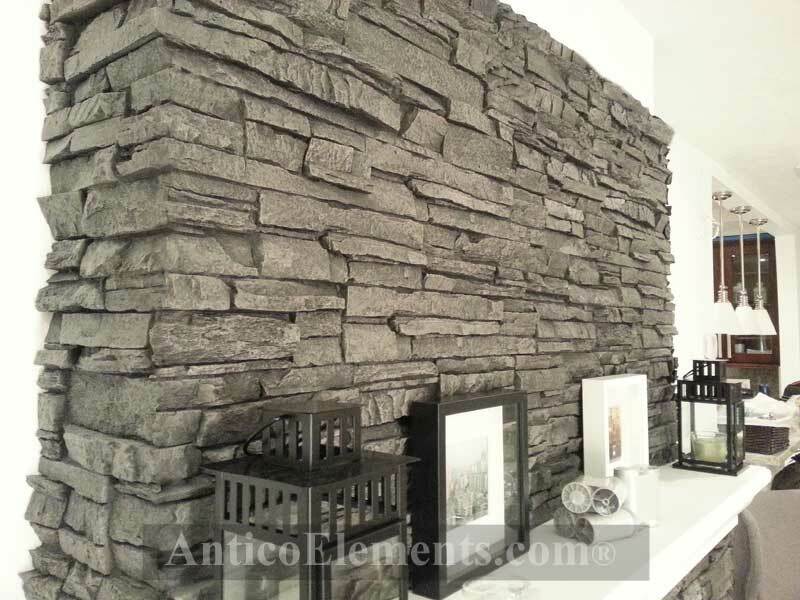 I showed it to a few friend and they too were taken back at the realistic look of the stone panels. I have given out your company info to several of my friend that plan on buying similar item from you." Steven G. - Cheshire, MA. 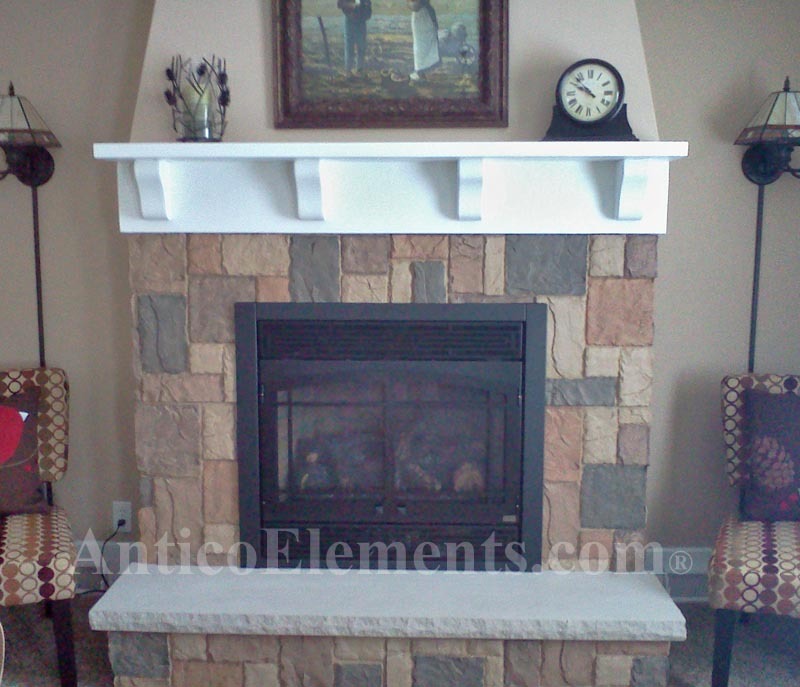 "For my fireplace Antico faux stone has provided the most attractive natural looking stacked stone versus any other material I have found. 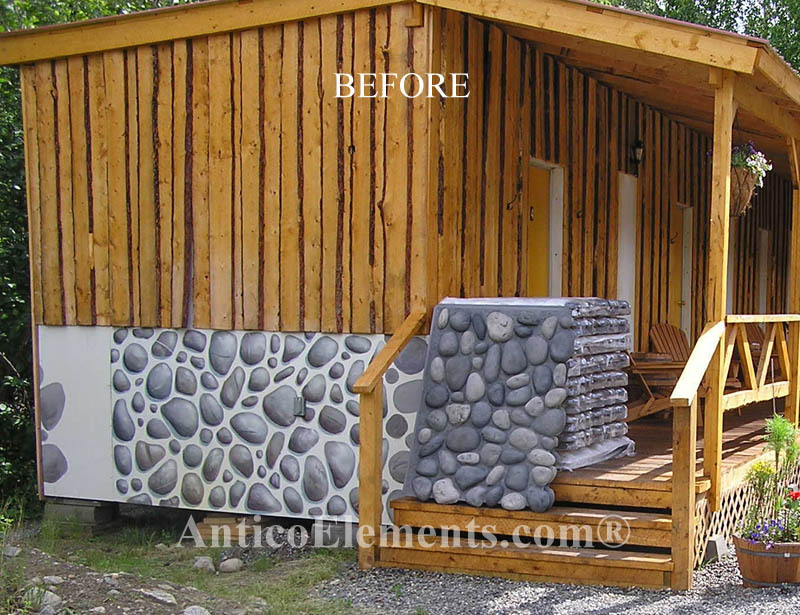 The hand painting of individual stones with different color shades made it the winner. 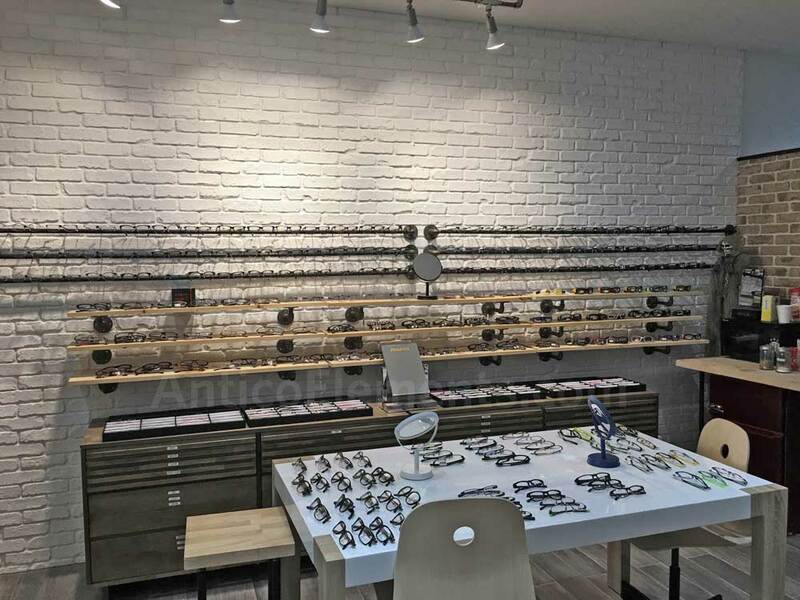 Their customer service is also very good." George K. - Wisconsing Dells, WI. 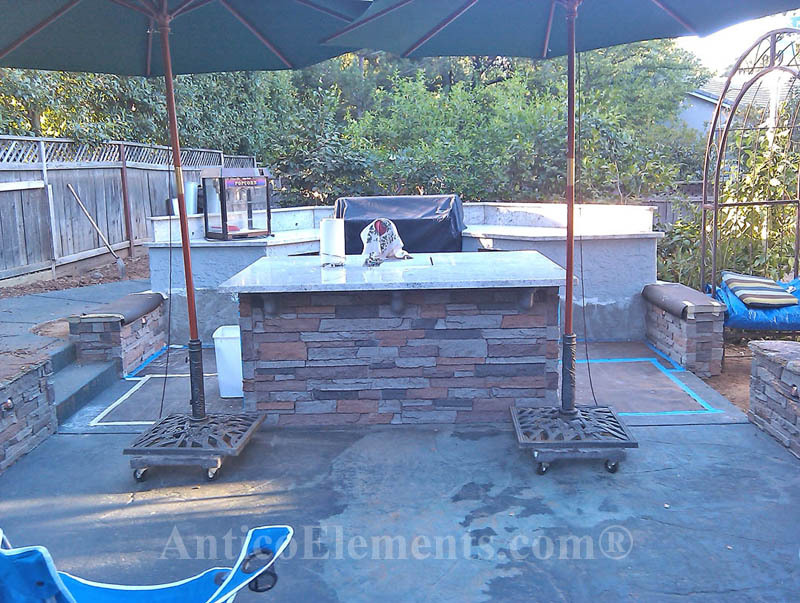 "I looked for about a month for what I thought would look the best for my outdoor kitchen/bar. I stopped looking after I received your samples in the mail. 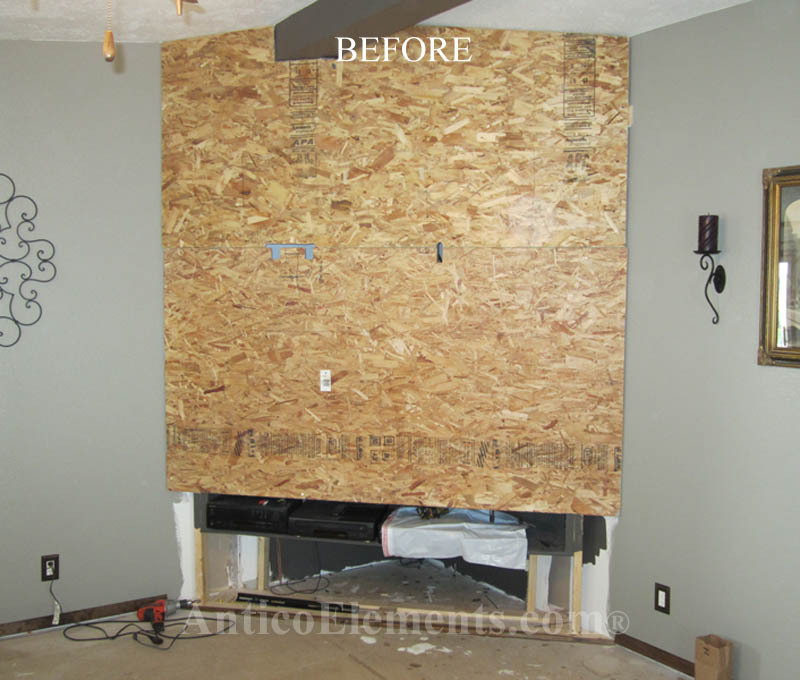 Your attention to detail was great and the quality of the material saved me money by allowing me to attach the panels directly to the stud and bypass the purchase of plywood. I have had a number of people have to touch the panels to believe it isn't real stone. I have passed your information to many of my friends without fear that they wouldn't be happy. 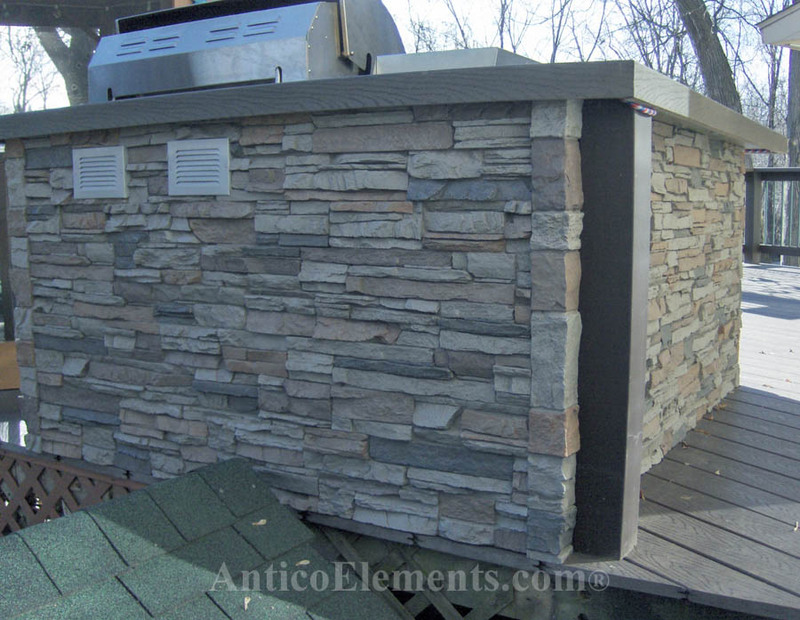 As an added bonus your panels were a big time saver. Thanks." Shawn K. - Pittsburg, TX. 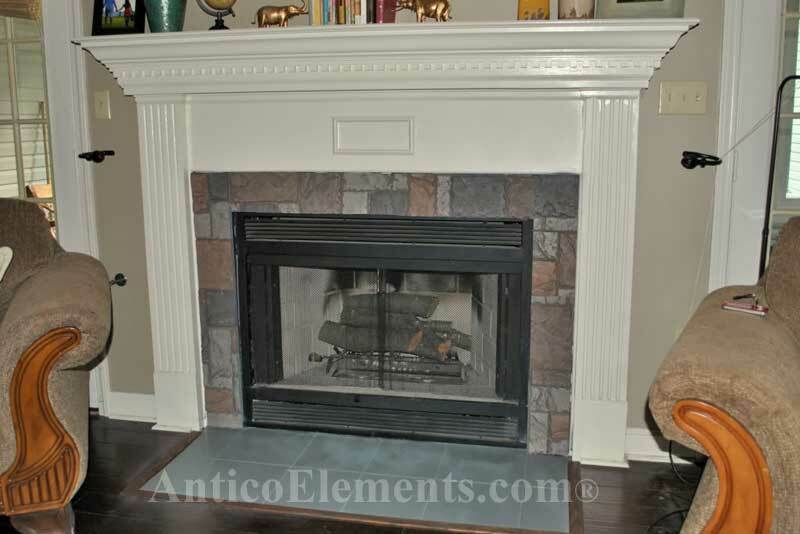 "Thank you for this wonderful product and great customer service." 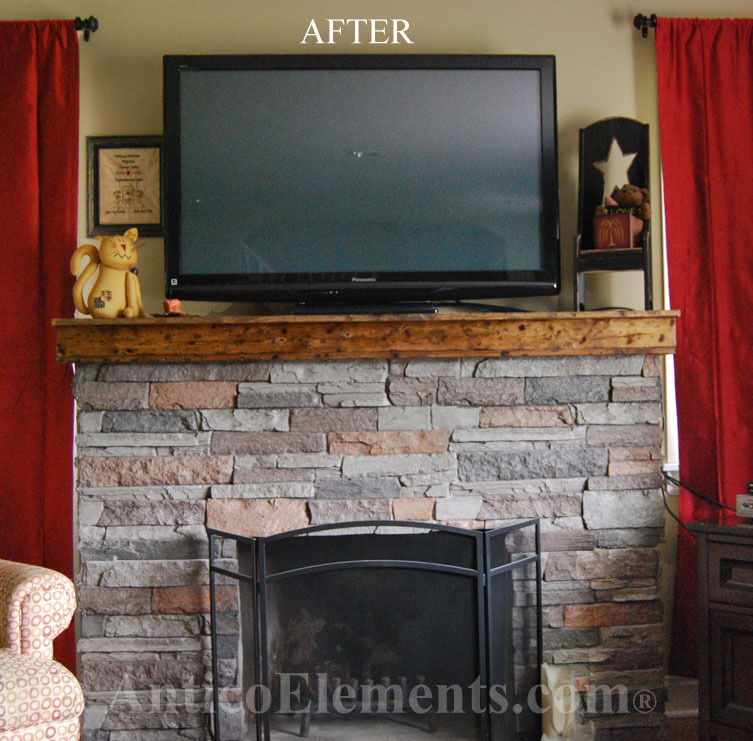 Marcy G. - Highlands Ranch, Co.
"Hi, I love the way my wall turned out! I was worried I would screw it up before I started, but it turned out to be so easy to work with! I am a 54 year old woman & had no problems at all! Everyone who has seen it thinks it's real stone. I have recommended your company & products to many of my friends. 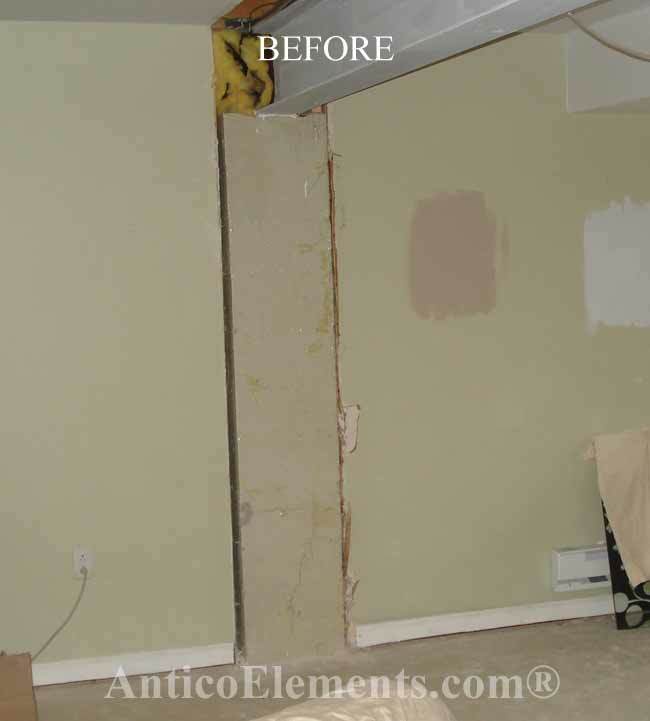 Attached are some photos of before & after. Thanks." Joanne K. - Mount Airy, MD. 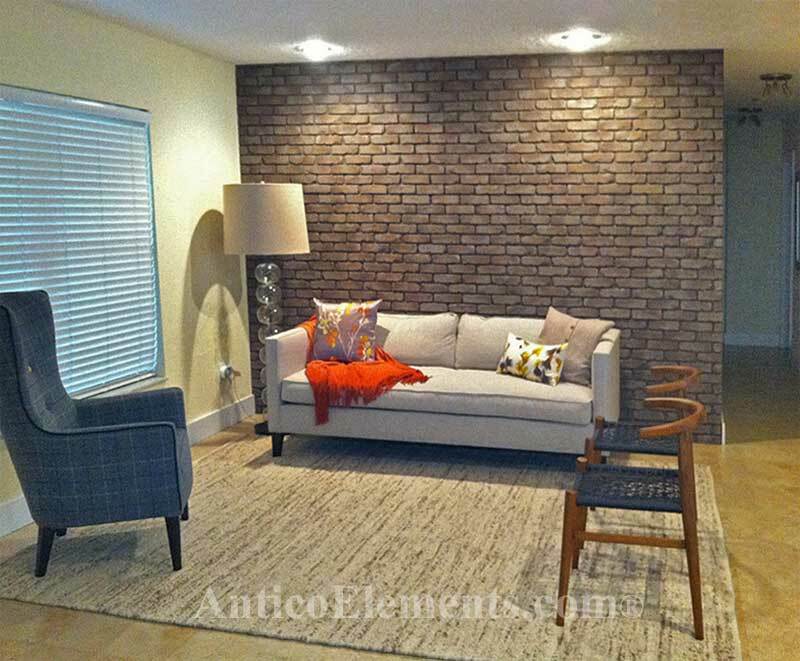 "We have been pleased with our shipment from Antico Elements. 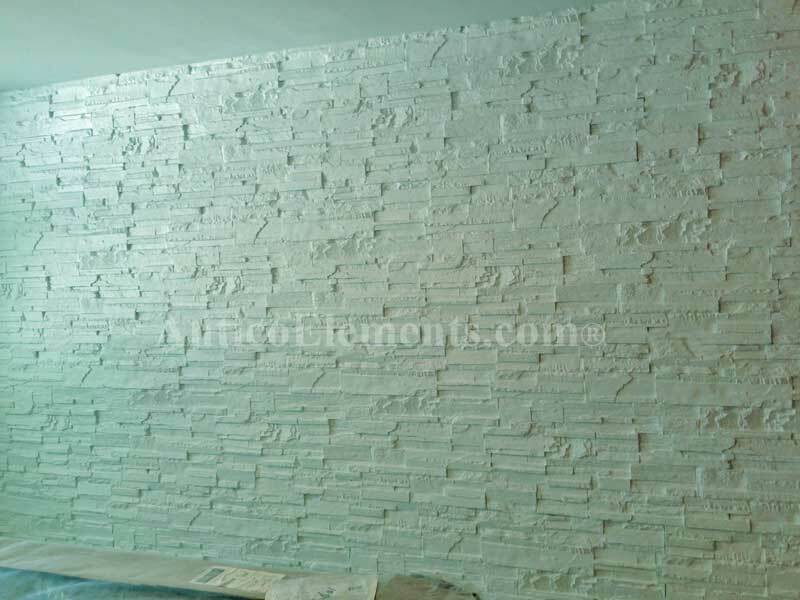 The sheet looks very stone-like and many people go up close to touch it to see if it is real or not. It was pretty easy to work with. 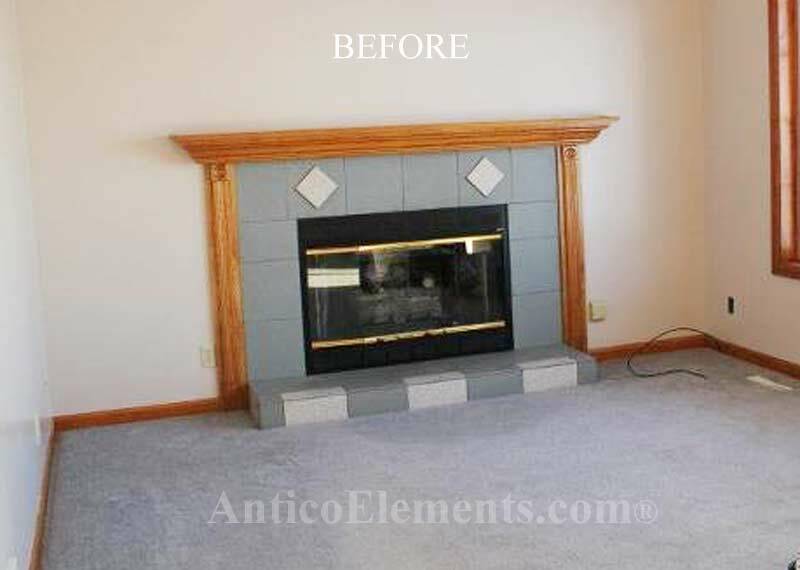 My husband and I surrounded the fireplace with this product. Cutting it was no problem and to make the edges real looking after cutting, we used a small saw or metal file and carved away at the edges. Thank you for this wonderfully crafted product." Bonnie S. - Bella Vista, AR. 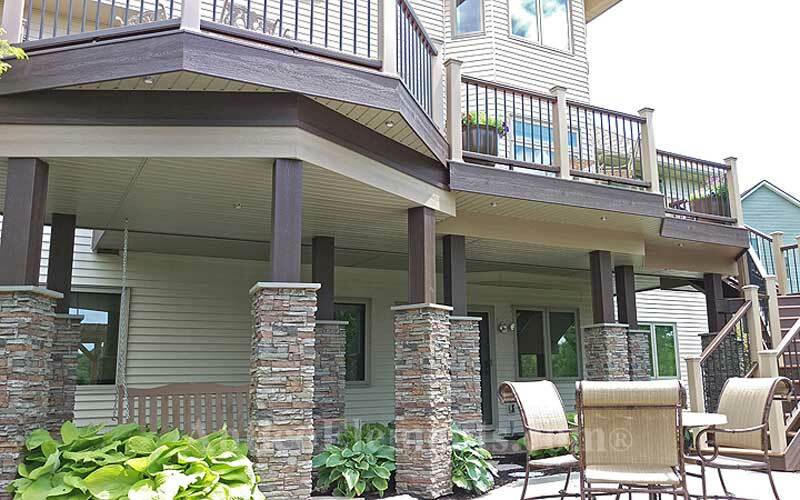 "I want to tell you after 40+ years of home improvement projects I have accomplished that your products are the absolute very best I have had the pleasure to work with. 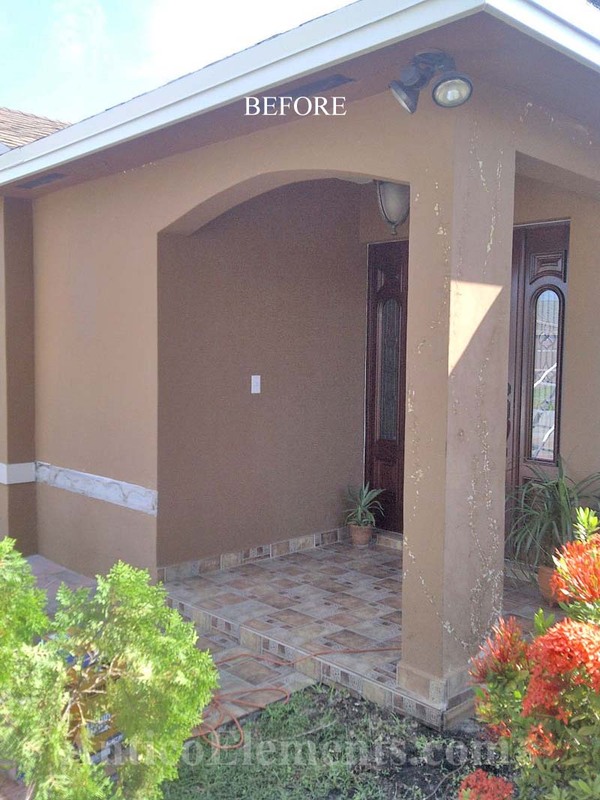 Everyone who has seen the finished work is absolutely amazed. 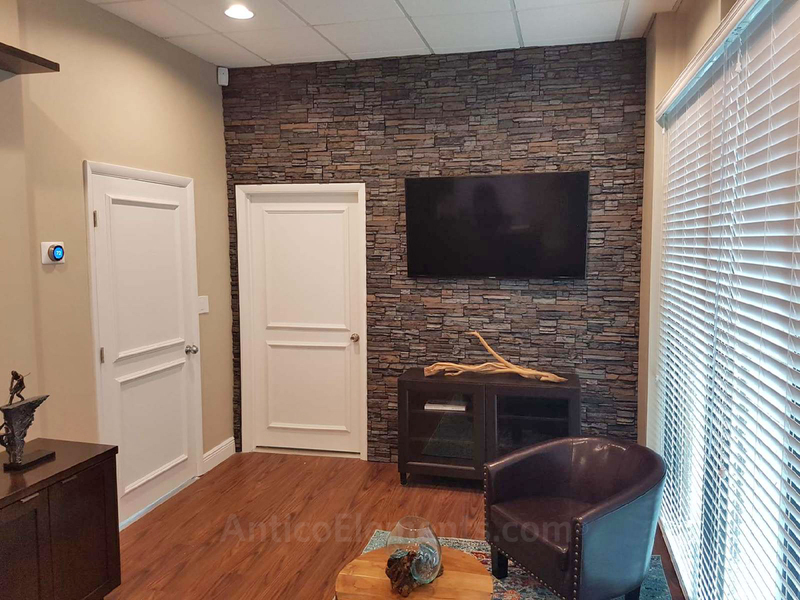 Antico stone is the crown jewel of my wine bar area and has dramatically enhanced the beauty of the entire (Man Cave) room!" Sincerely, Gary T. - Frederick MD. 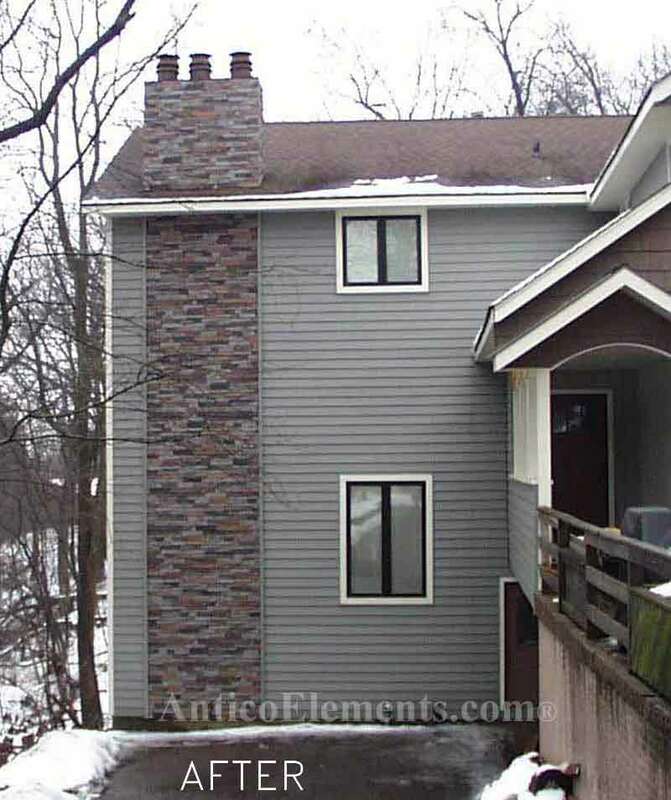 "We used the Alpi Stone Dry Stack Panel in gray for this project. Our order arrived timely, well packed and the quality was great. 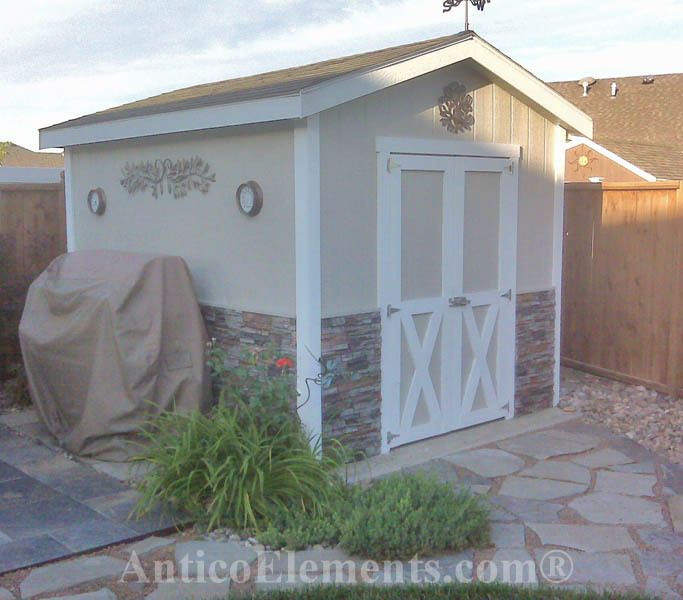 The panels were easy to install (we did the entire shed in about 3 ½ hours) even for non-carpentry professionals. I could not be happier. 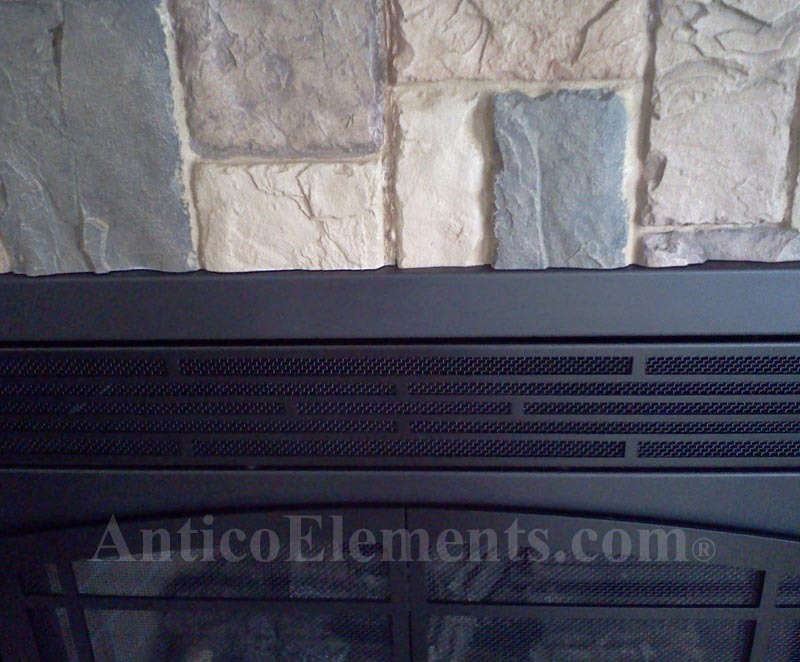 Thanks, I am looking around the house to see what Antico Element product I will use next." Lesley W. - Salina, KS. 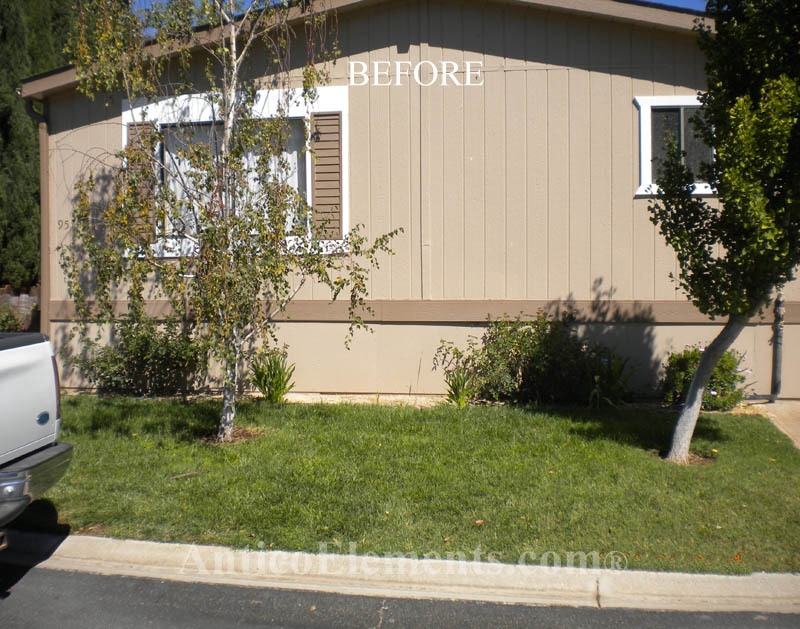 "Here are the pics of the house before and after, sure does look real good. Thanks so much." Francis B. - Glen Burnie MD. 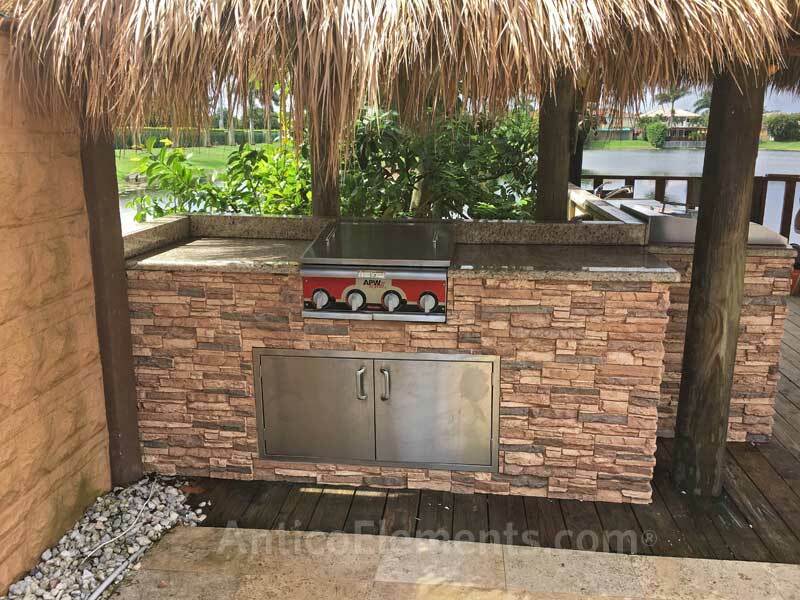 "Your stone panel products were the perfect answer to finish my outdoor BBQ Island. 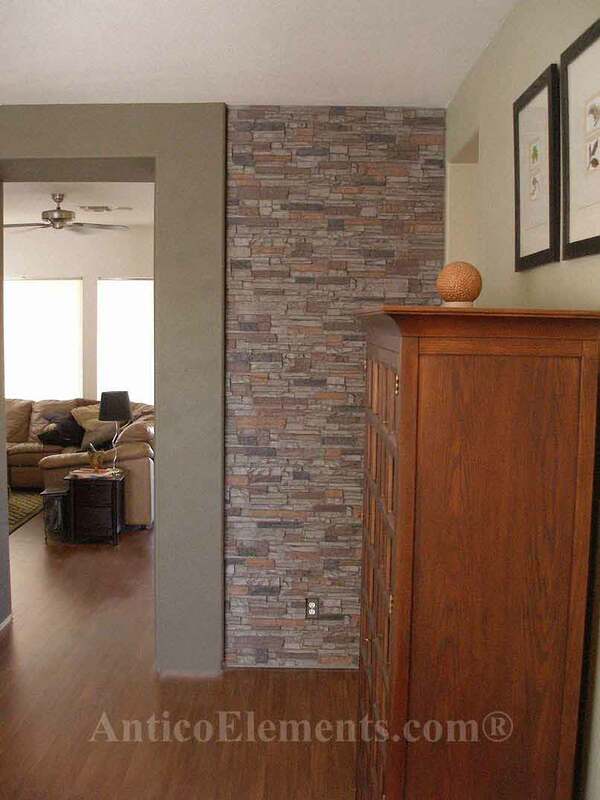 My wife and I (and our friends) are amazed at how lifelike the stone panels look. 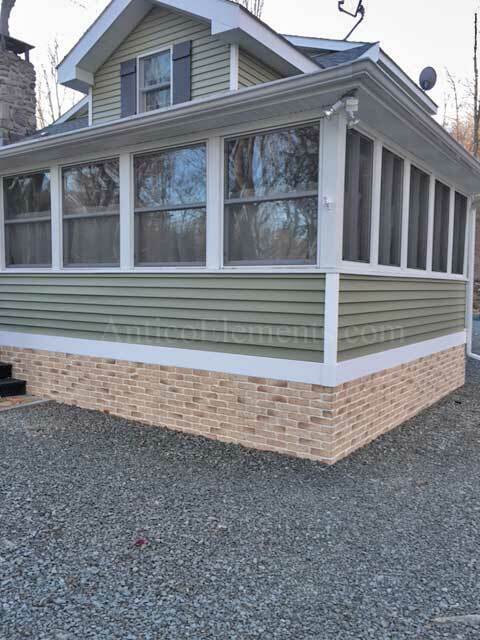 They were easy to install, however, I do suggest buying the outside corners and not trying to miter the panels to fit. I had to wait 3 weeks for my product to arrive, but it was worth the wait. 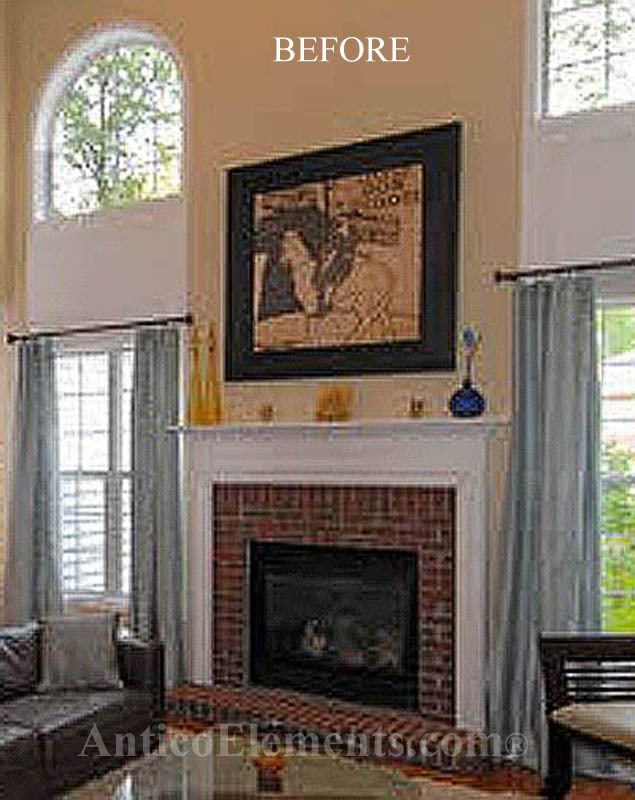 Overall, I rate your products 10 out of 10 and am completely satisfied." Tom A. 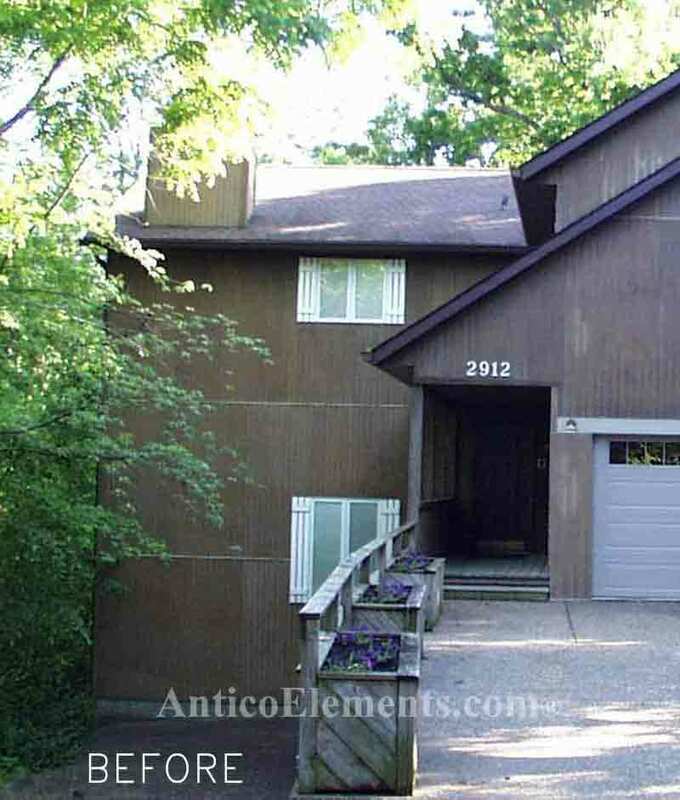 - Minnetonka MN. 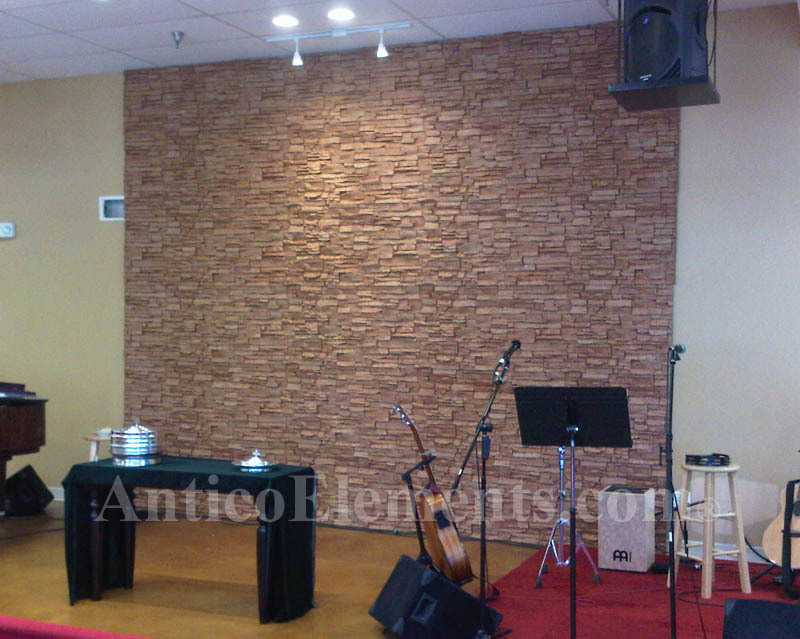 "I would like to submit a photo showing the finished back wall in our church sanctuary. Hope you will find it useful." 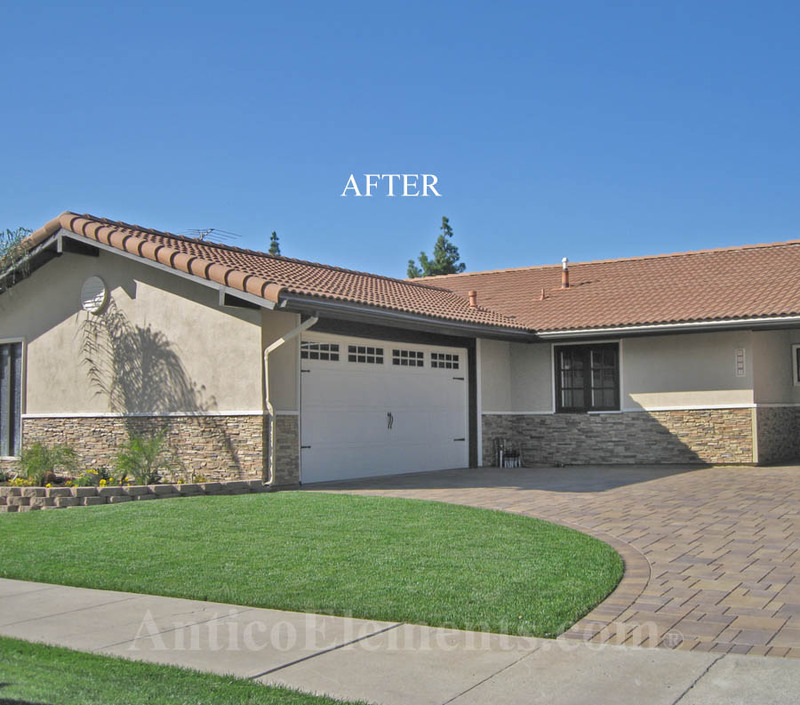 Anthony C. - Irvine, CA. 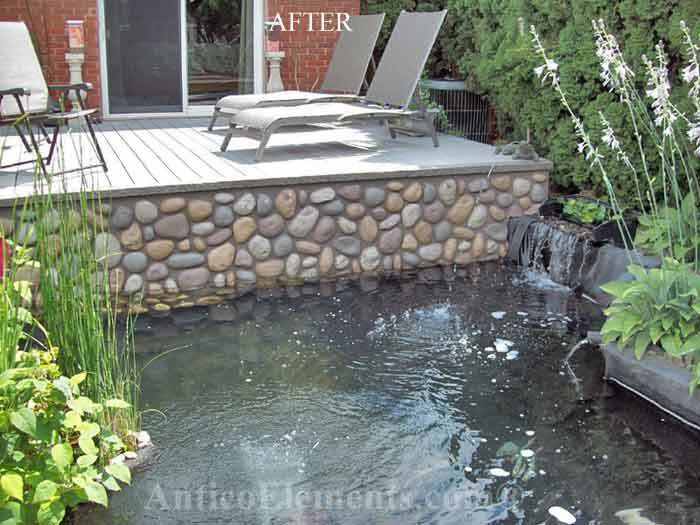 "It turned out fantastic! I love it. Everyone who sees it loves it. Installer said it was easy to install. A great product! 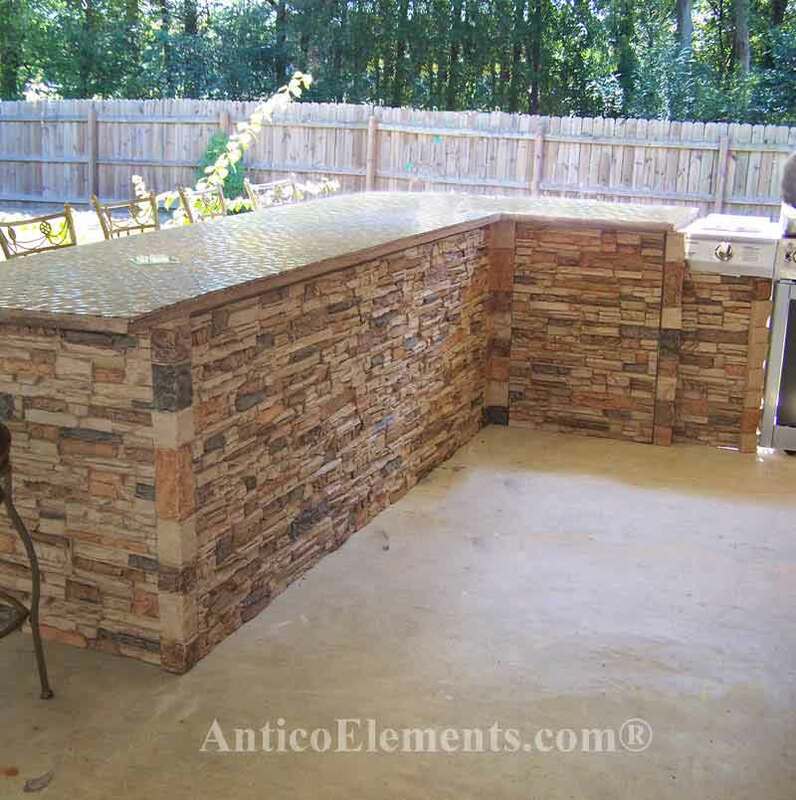 Thanks for everyone at Antico Elements for the kind help in this project." Eddie G. - New York, NY. 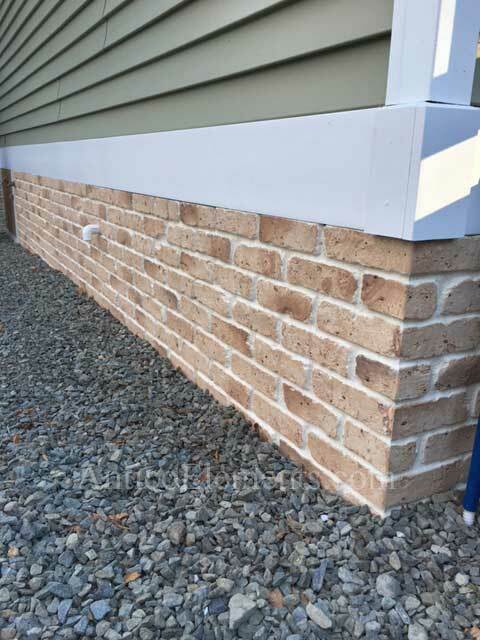 "Your brick looks great! 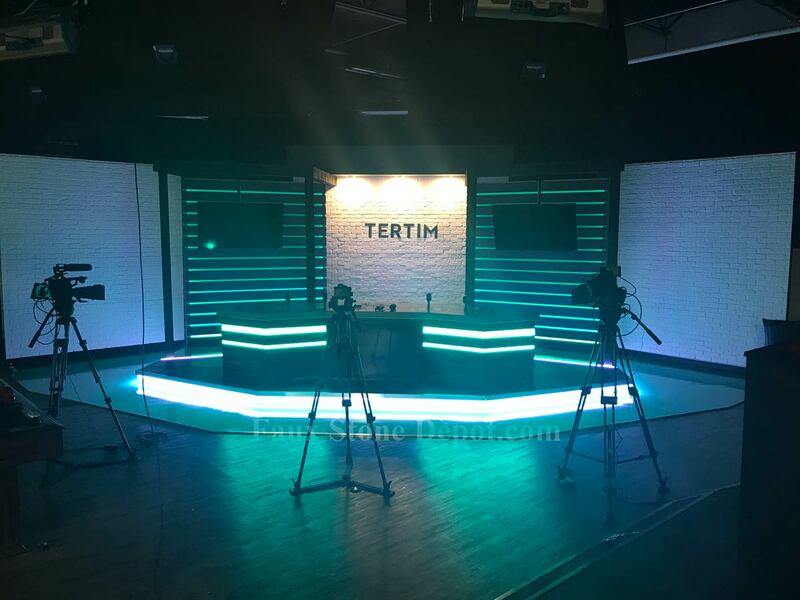 It was the perfect finishing touch for our set and looks great on camera. Best Regards,"
Matt B. - Dallas, TX. 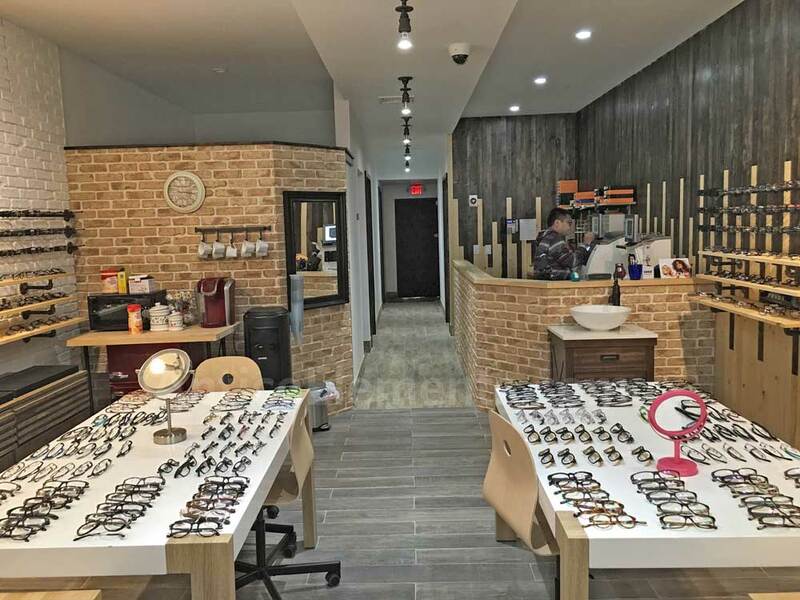 "This is **** Eyewear with your faux bricks installed 2 months ago"
Herminio F. - Great Neck, NY. 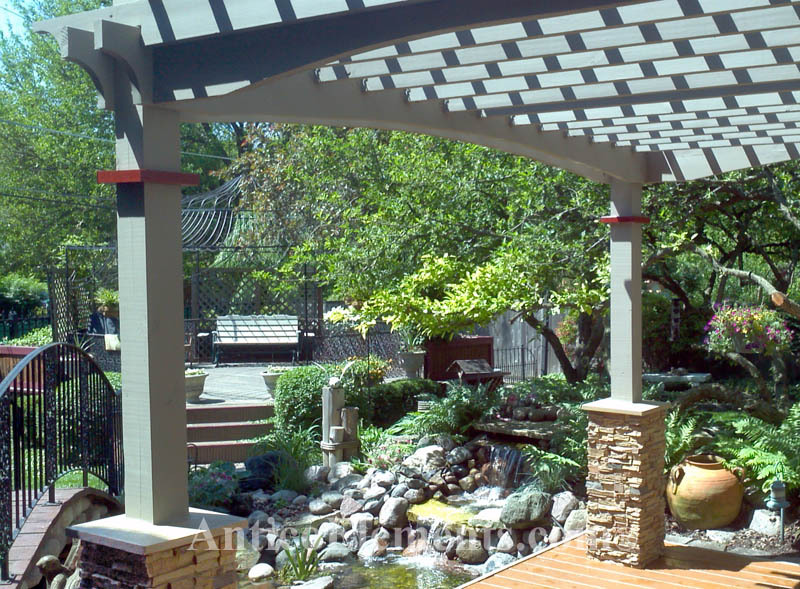 "I absolutely love the product and was very pleased with your installer. 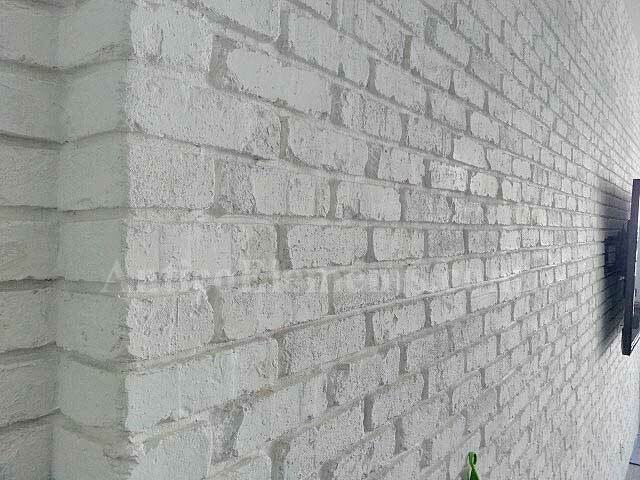 Everyone that has seen the wall has said how great it looks. I will definitely take some pictures and send them your way. It has been a pleasure working with you!" 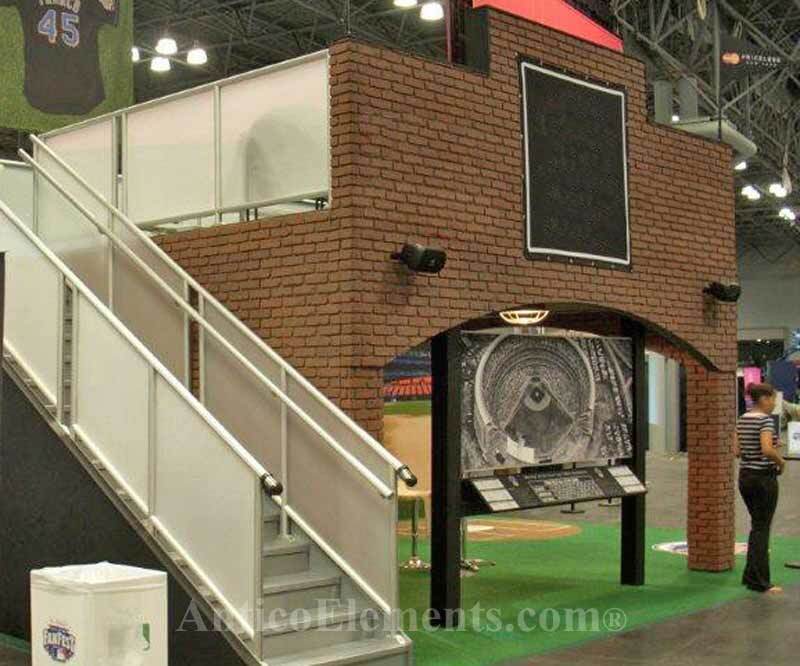 "All went great at the show. 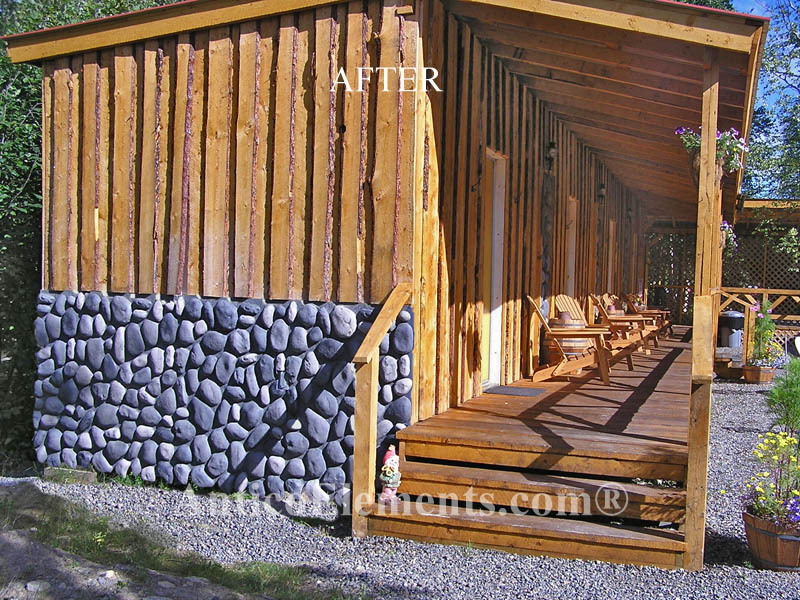 Client was very happy. 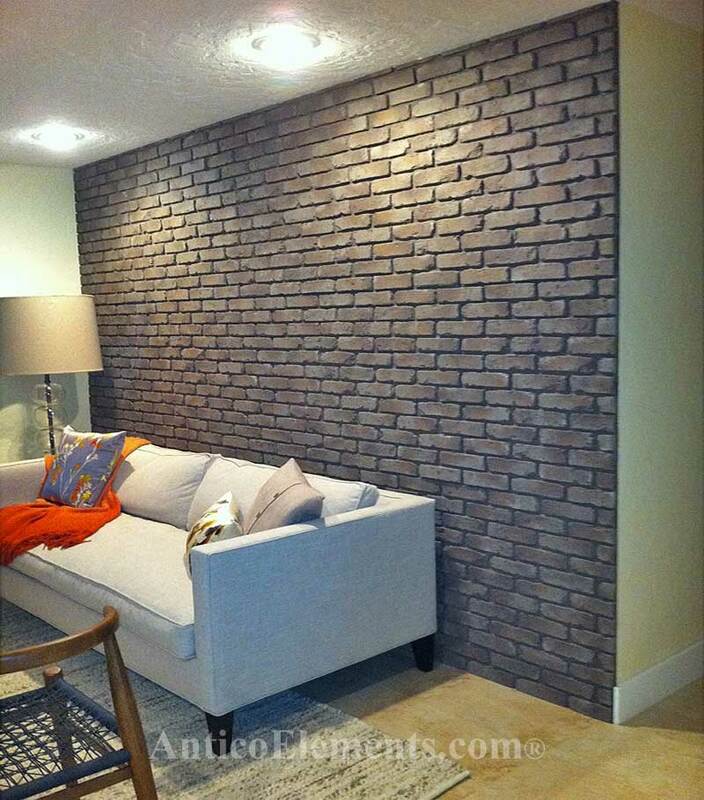 Some pictures for you to see what we did with your brick product"
Jim A. - Dallas, TX. 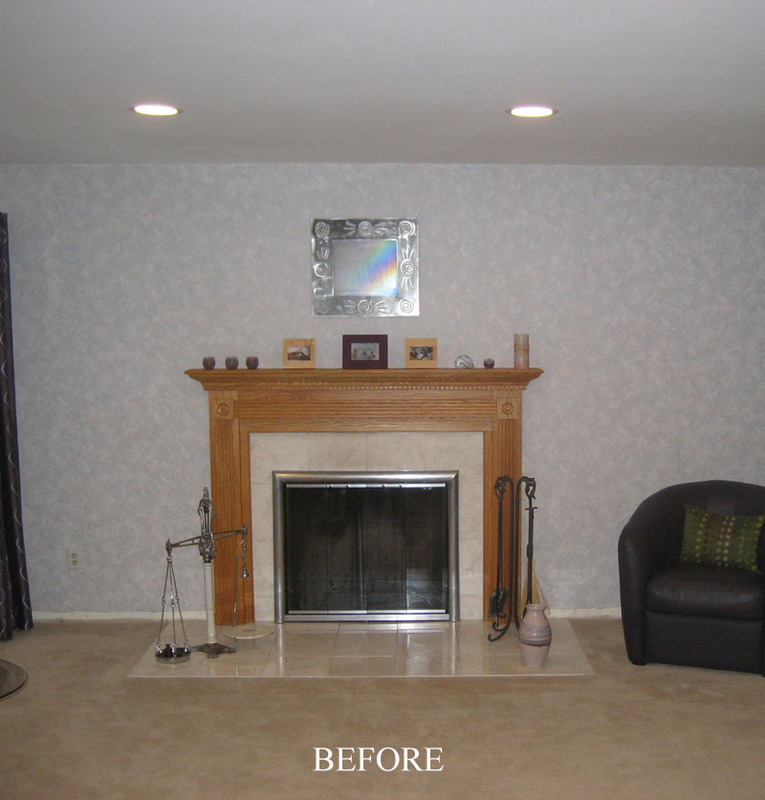 "We couldn't be any happier with the way the walls turned out. Thanks!" Suzy - Miami Beach, FL. "Thank you very much for your quality product. 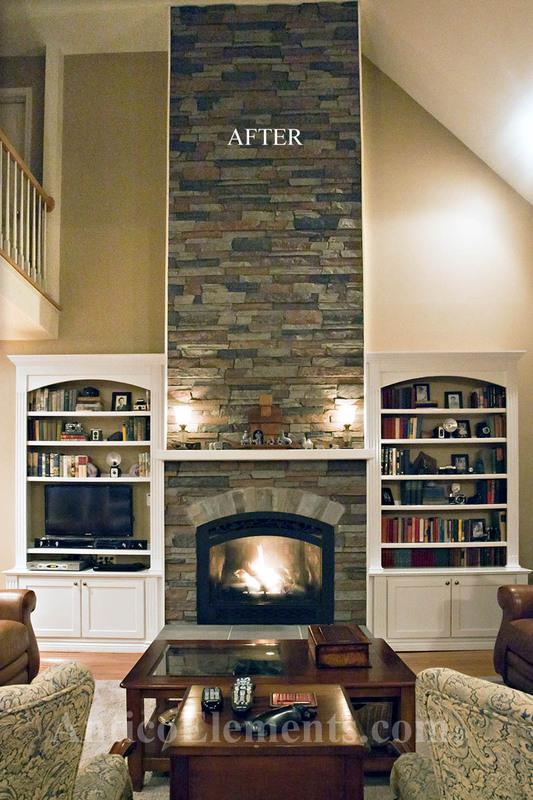 Here is a quick pic of my finished media center." 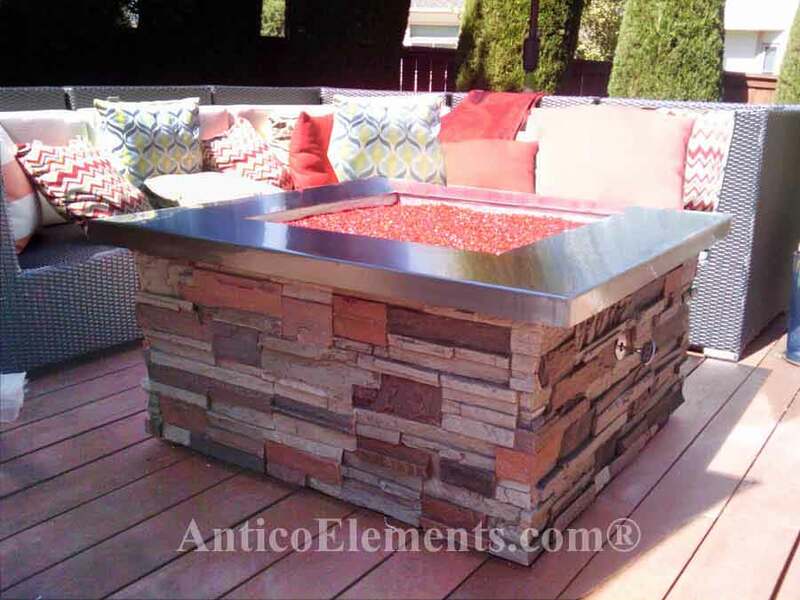 Alex C. - Farmers Branch , CT.
"Photos of my homemade firepit." Michael K. - Denver, CO.
"Steve M. - Fort Lauderdale, FL." "Hi, just wanted to thank you for all your effort to make us happy, you went the extra mile. You made it right by sending us four new panels. I will be glad to recommend your company to friends and family. 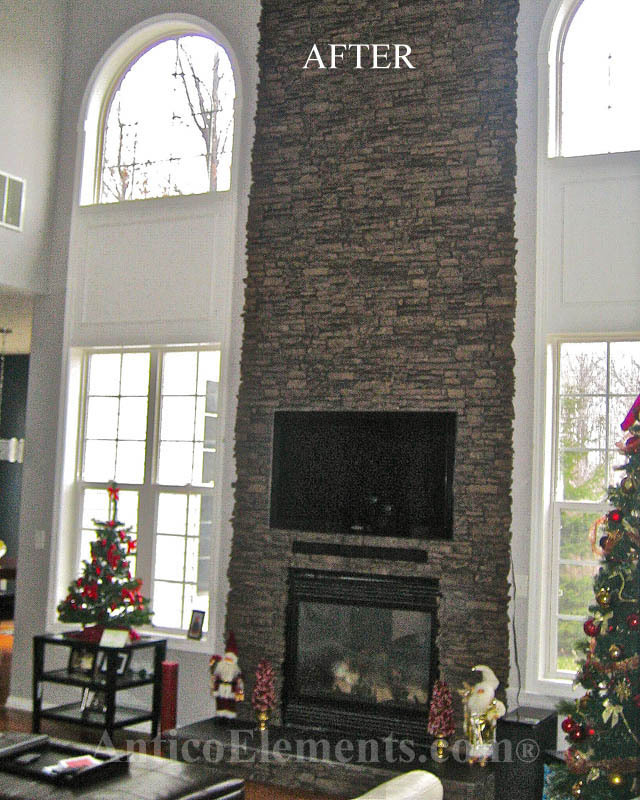 We love how the stone looks behind our fireplace"
Virginia L. - Baltimore MD. "This product is great. Nobody knows it's not stone, unless I tell them. Then they don't believe me and tap on it before they believe it. Larry P. - Folsom, CA. "I am completely satisfied with everything I purchased from your company and the excellent manner in which you response to any questions or problems and would recommend your company to anyone else. Thank you and in addition thank you for the coupon." Stephen P. - New Carrollton, MD. 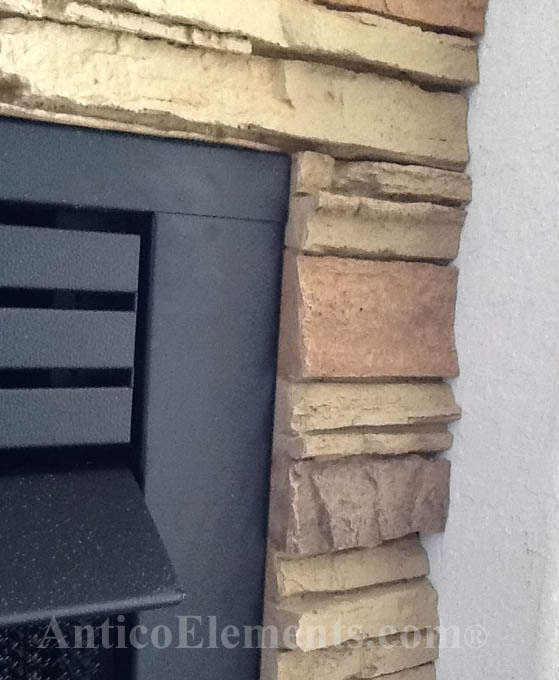 "When we bought our house, the fireplace had these 4 ugly black vents in the brick. I immediately knew something had to be done to cover it. 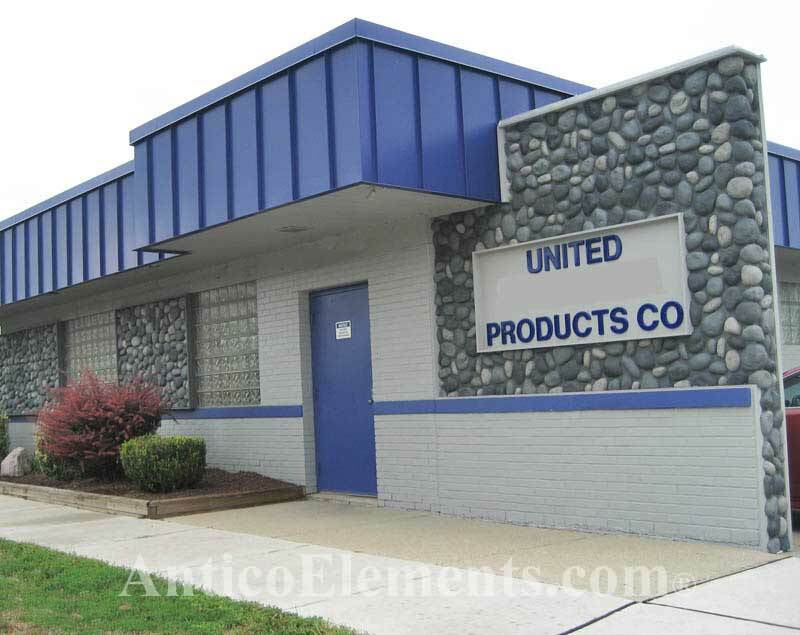 I searched the internet and came across Antico Elements. Your company’s excellent customer service through the chat feature was a HUGE selling point for me. 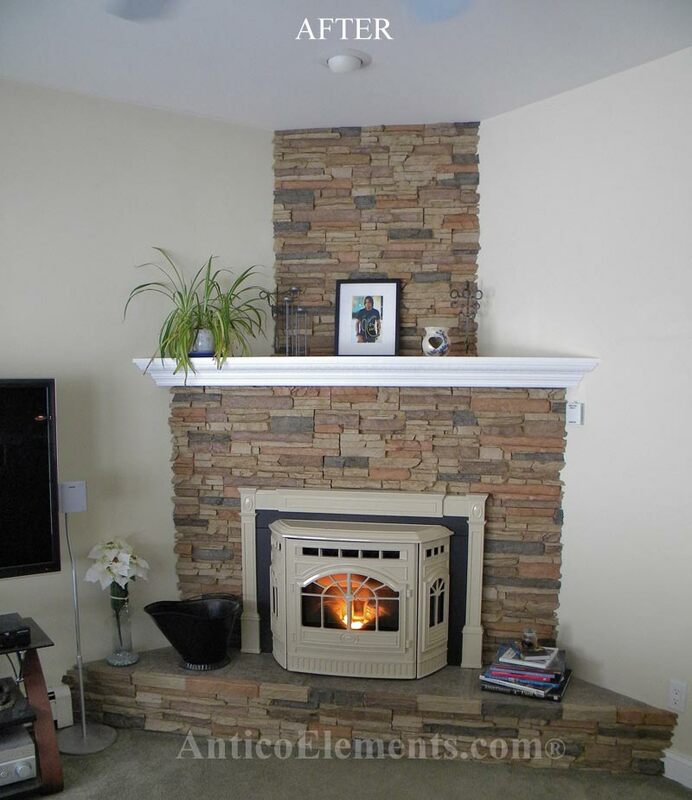 The panels were easy for my husband to cut and install. I did all the touch up painting, and we are both so pleased with how the end result looks! 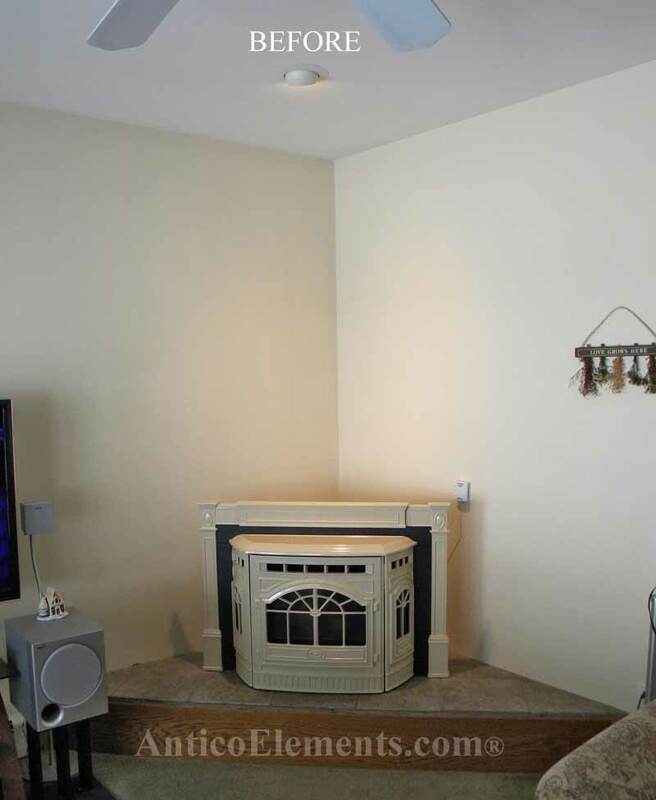 The new fireplace was a hit at our Holiday Housewarming. Thanks SO much!" Melissa S.. - Damascus, MD. 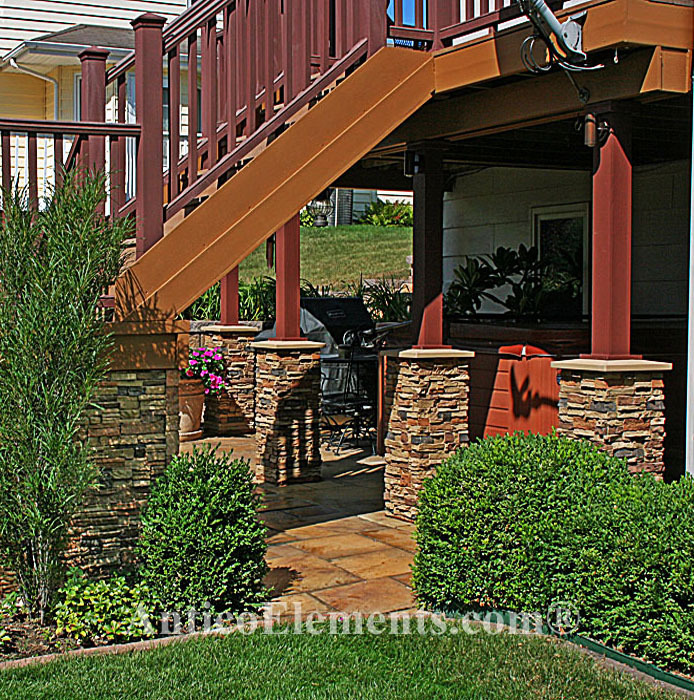 "We are replying with a big Thank You for the product from your company! 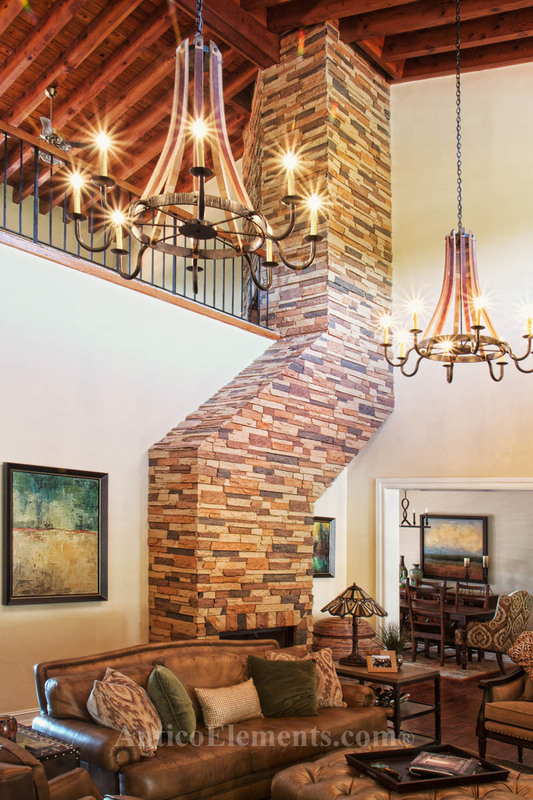 The project turned out stunning and we are thrilled! 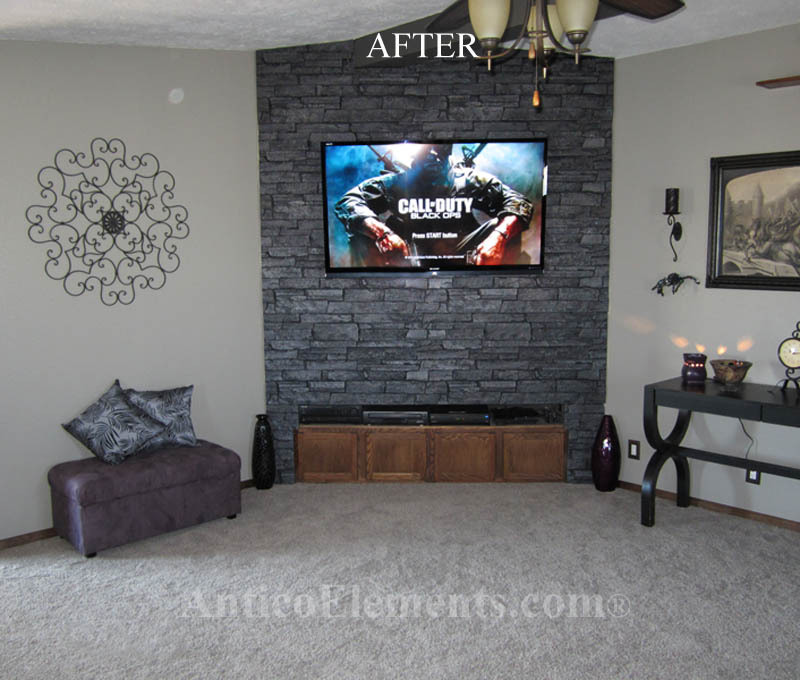 Attached are before and after pictures of our entertainment wall. 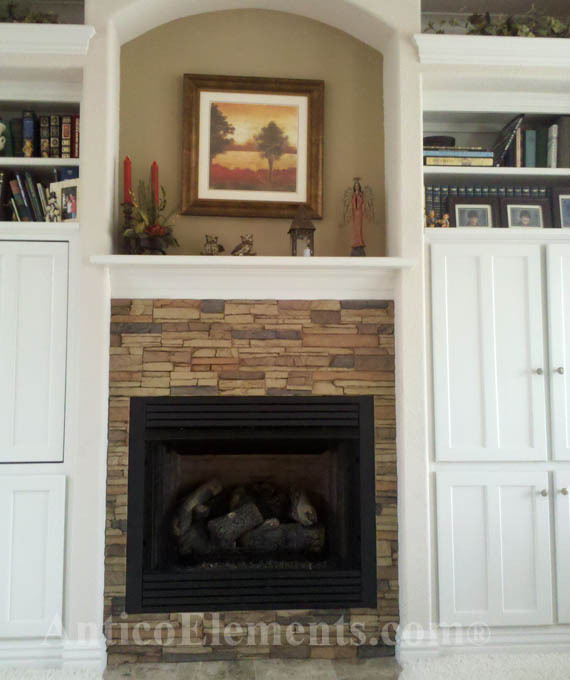 My husband did a great job and stated the faux was very easy to work with...and he's not a carpenter...more of a body man!" Shannon W. - Pine Bluffs, WY. 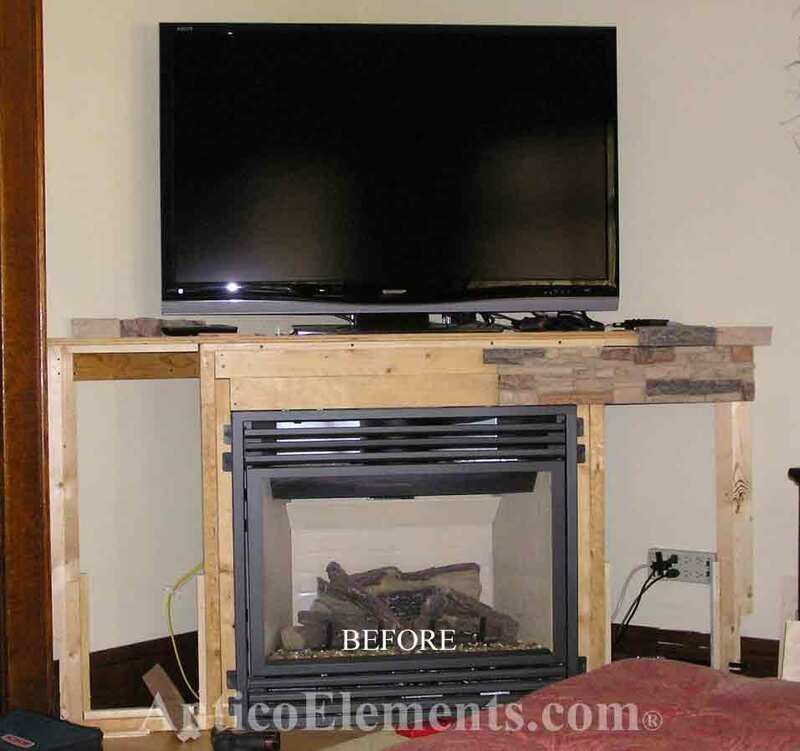 "Attached are two pictures of my finished project using your product. I think it came out really great, the stone looks great! 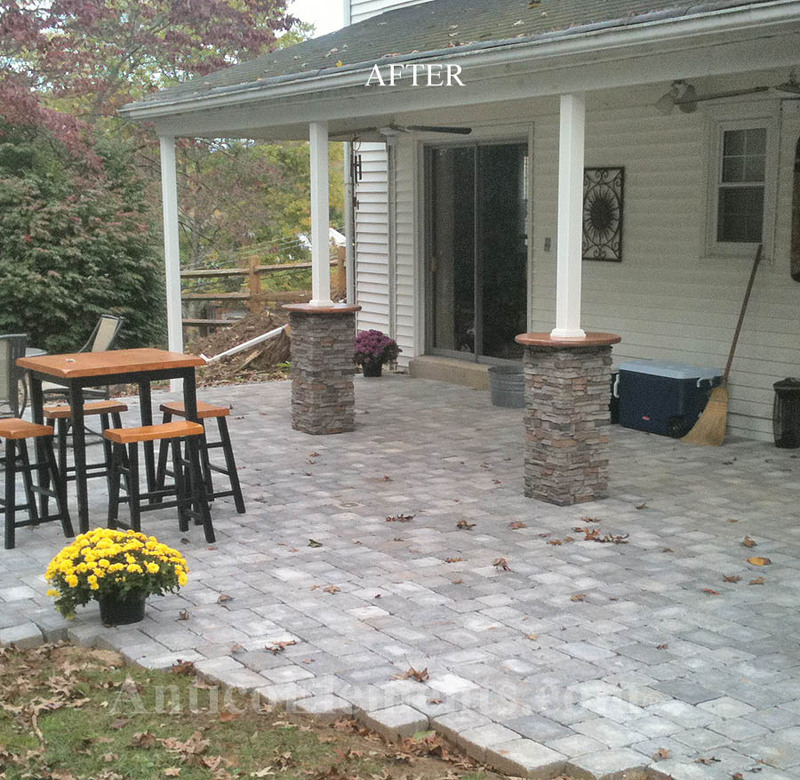 Thank you"
Ellen K. - Sterling, VA.
"The client was very pleased with the final look and the stone columns where very simple to install. 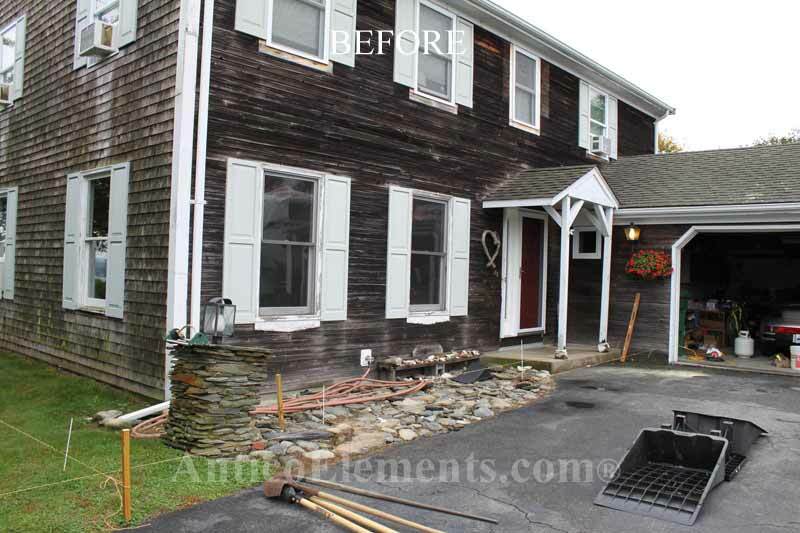 "Here is our before and after photos of our front porch. So many people stop while they're driving down our street to comment on our stacked stone columns. We absolutely love them!" 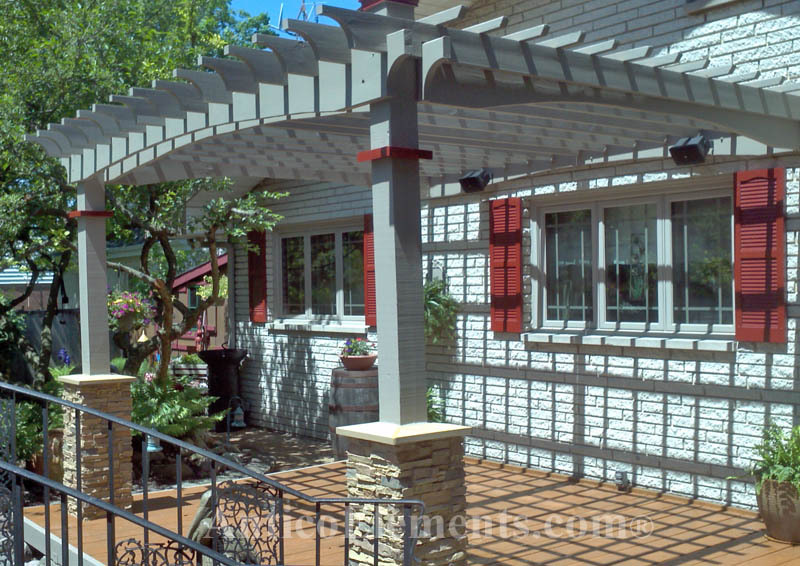 "I put this arbor on the back of my home and used the pillar warps around the 6x6 posts. They really help make this look like a first class project. Great Product!" David H. - Encino, CA. 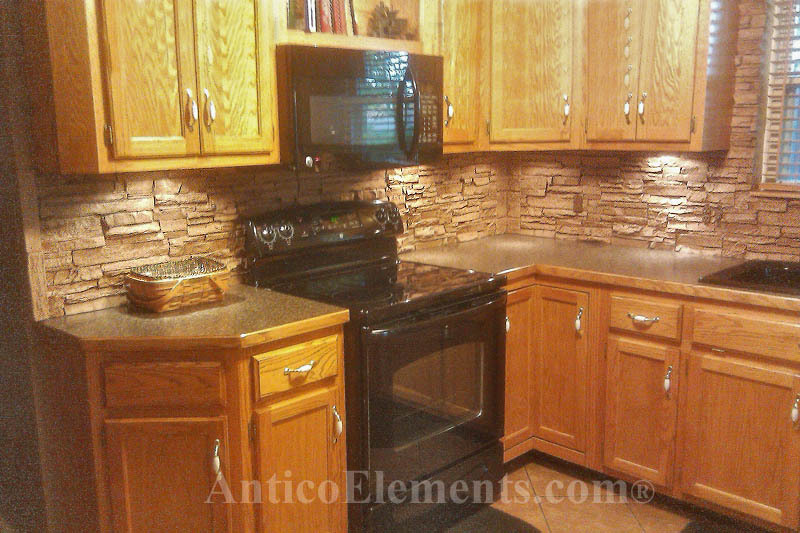 "I very much appreciate your rapid response and will happily recommend Antico Elements to others. Thanks very much! You've got a terrific product! " 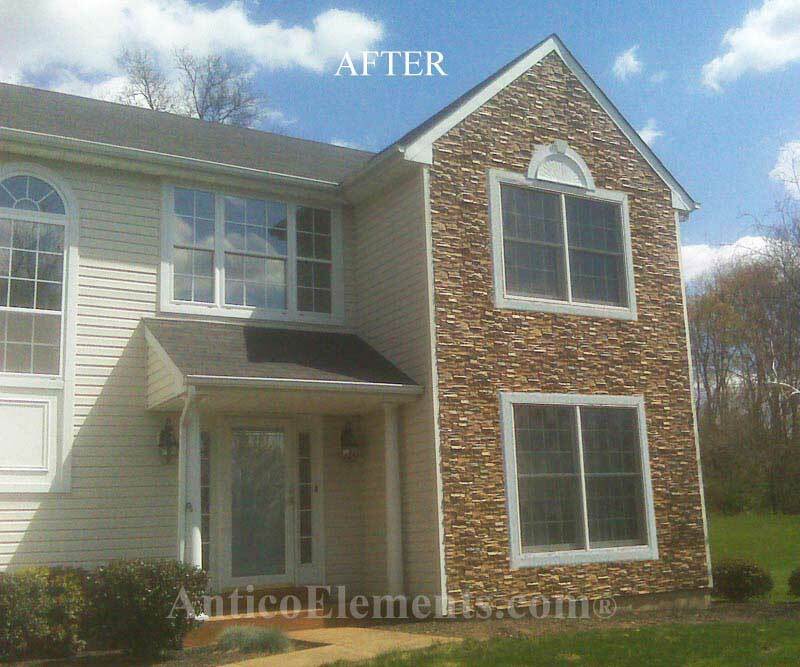 "Please see the attached picture of the post wraps we used for our client. The customer loves them! " 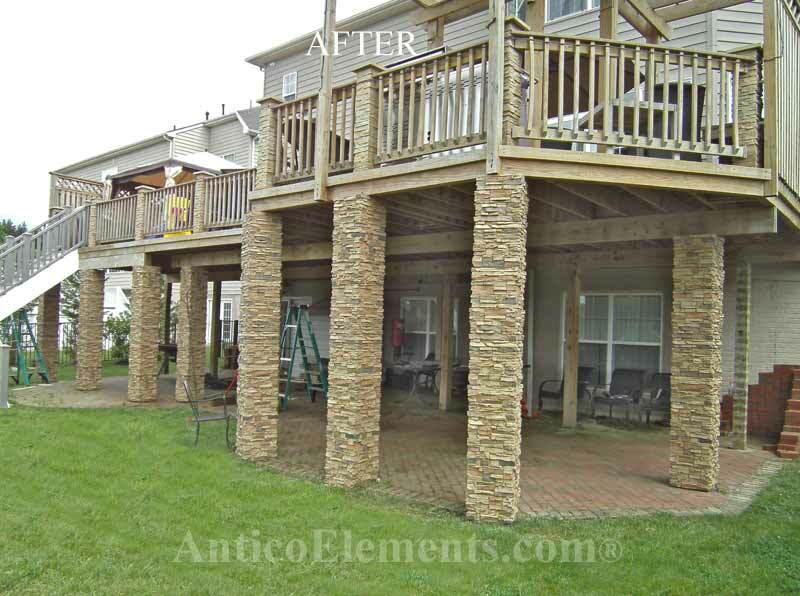 "We absolutely LOVE the column wrap that we purchased from you. Everyone that has seen it cannot believe it is not real. I was shocked how realistic it was when I opened the boxes." 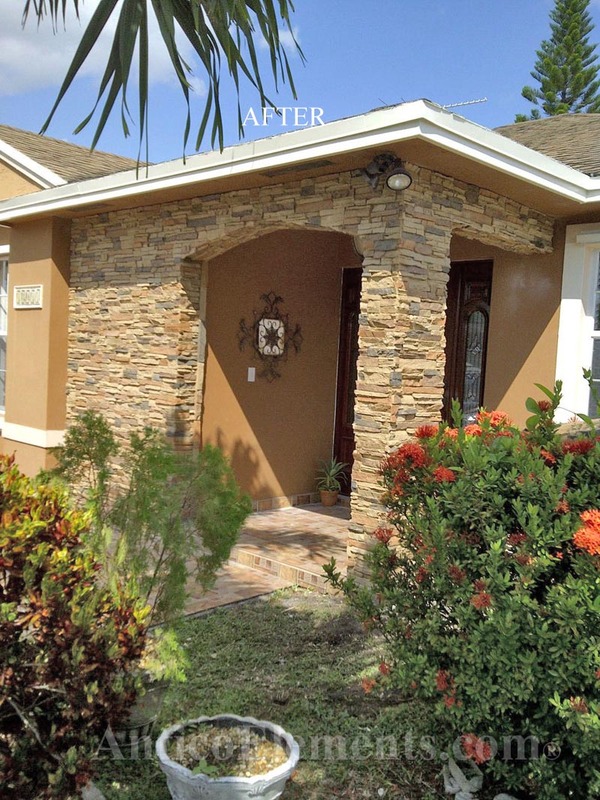 "Doing business with this company has been absolutely pleasant from start to finish. 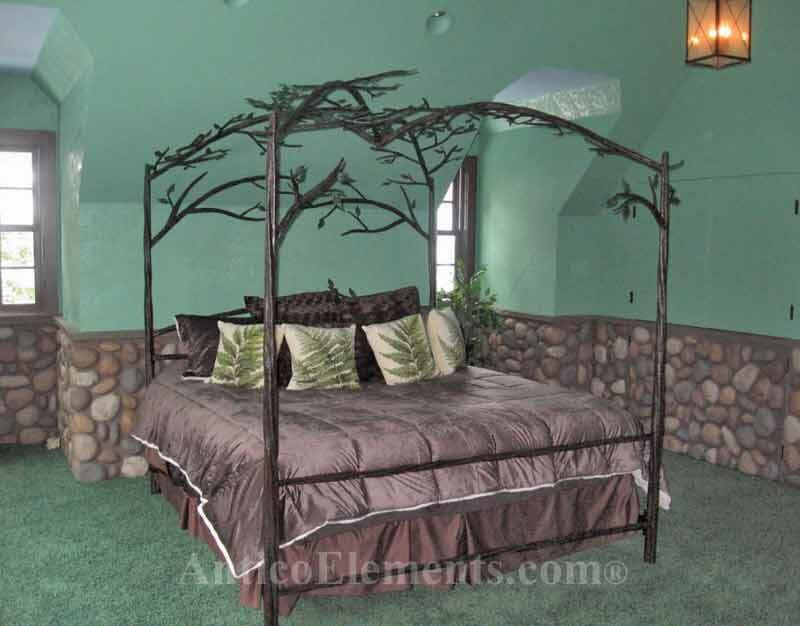 First of all, their product is of outstanding quality and beauty, yet reasonably priced. It is also amazingly easy to handle and install. I used nothing more than a jigsaw and a screw gun to do my project, since those are the only tools I can comfortably use as a woman. Secondly, I was most impressed with their customer service department. 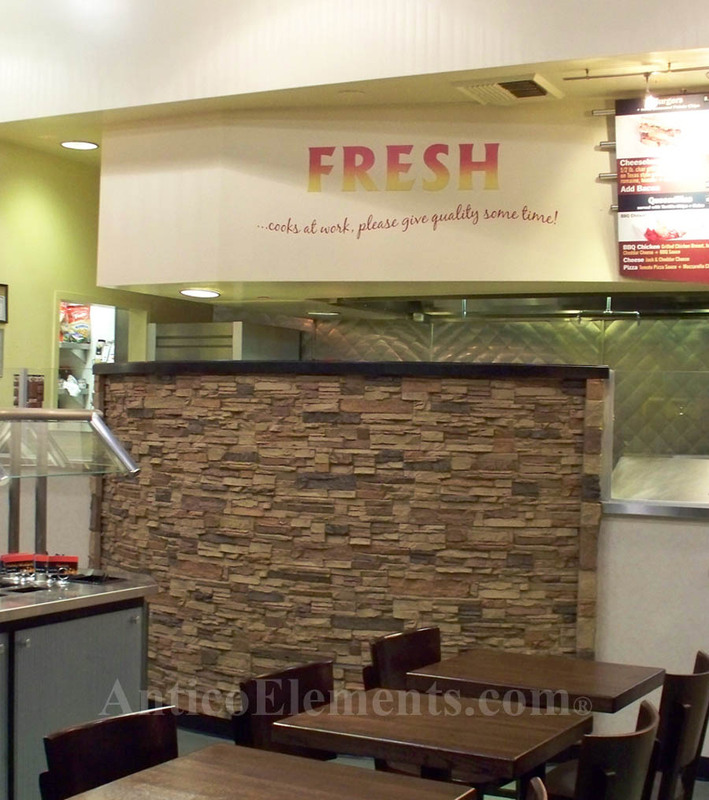 In short, my experience with Antico Elements has been 110% positive in every way"
Chris B. 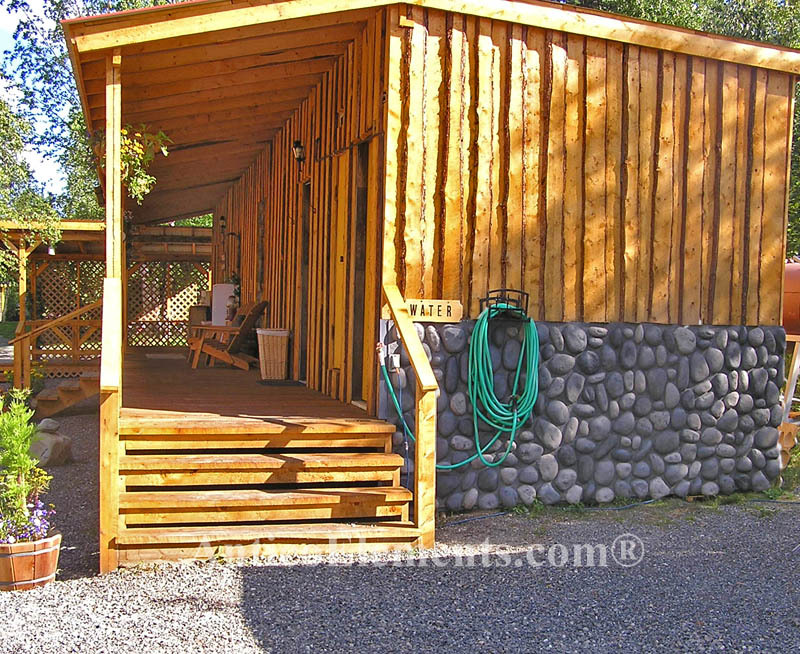 - Cathedral Creeks B&B, AK. 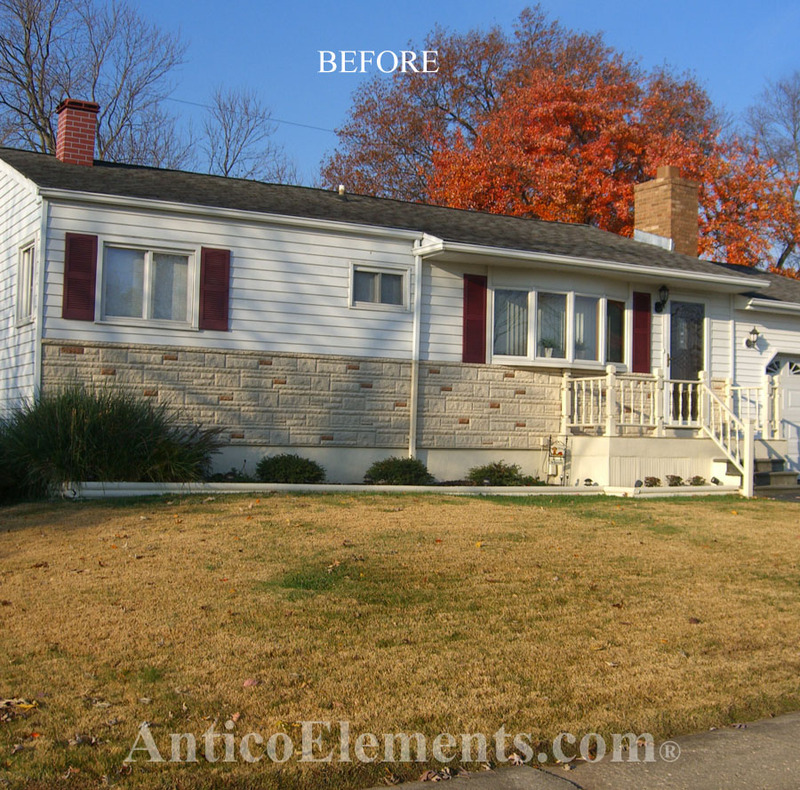 Jim S. - Dearborn Hts, MI. 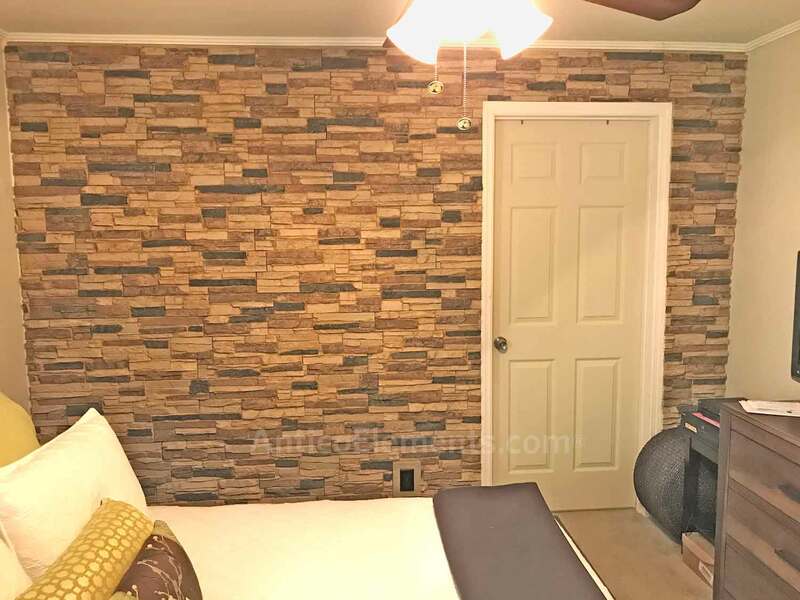 "Here is a picture of the finished wall in our room. We love it. 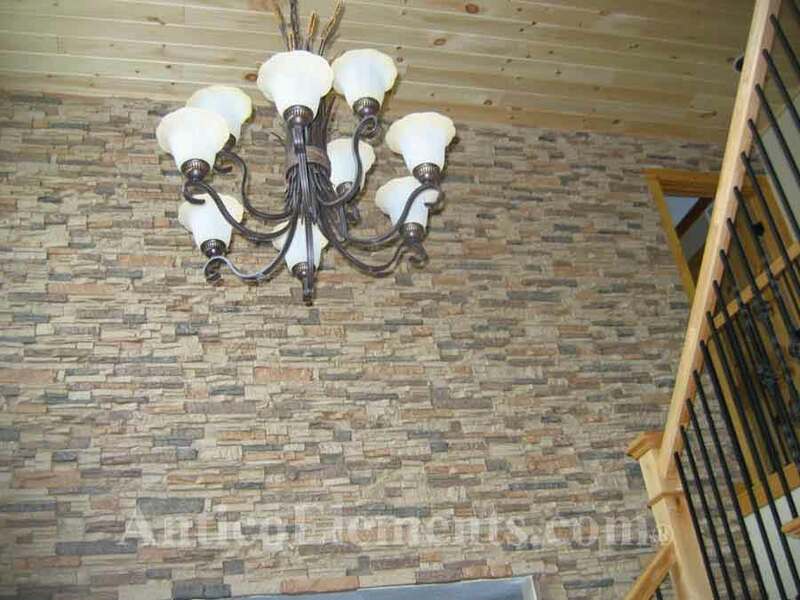 Our friends could not believe it was faux rock." Mike F. - Fresno, CA. 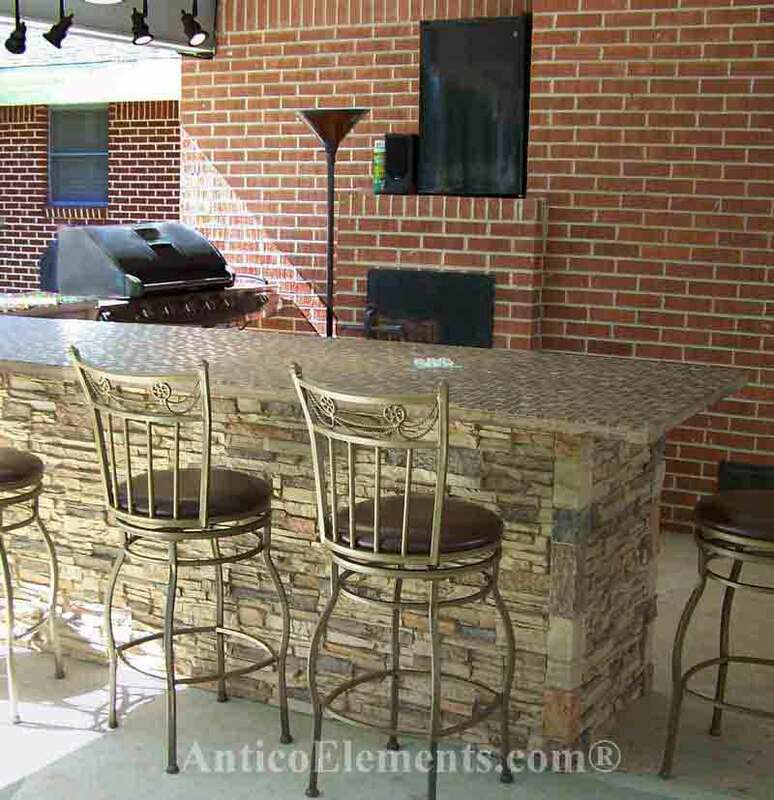 "We want to thank your firm and your sales department for a great product and service. 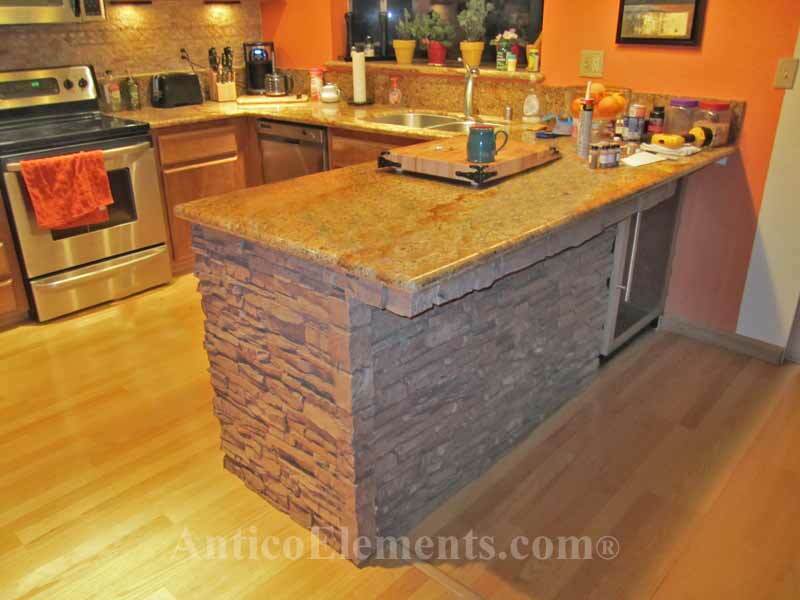 The material met all expectations in that it is both durable yet easy to cut to fit. 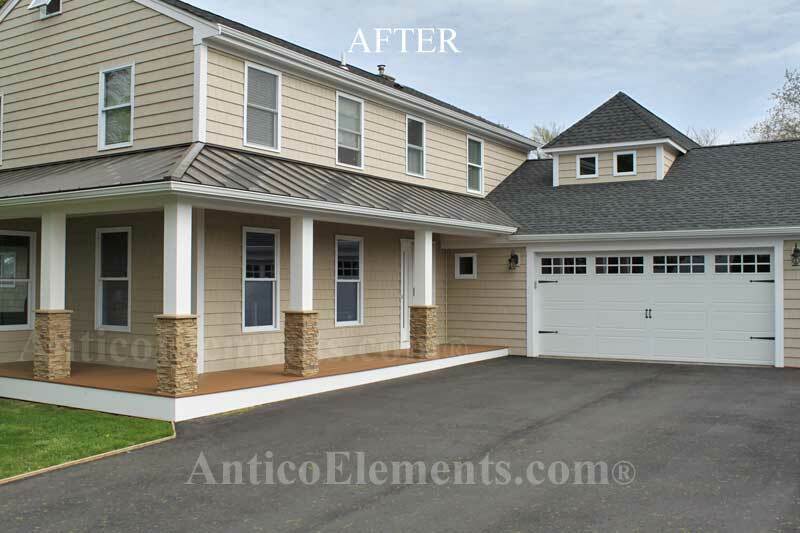 The authentic look is unmatched by any other product we researched prior to deciding on Antico Elements"
Mark & Lisa - Bridgewater, NJ. 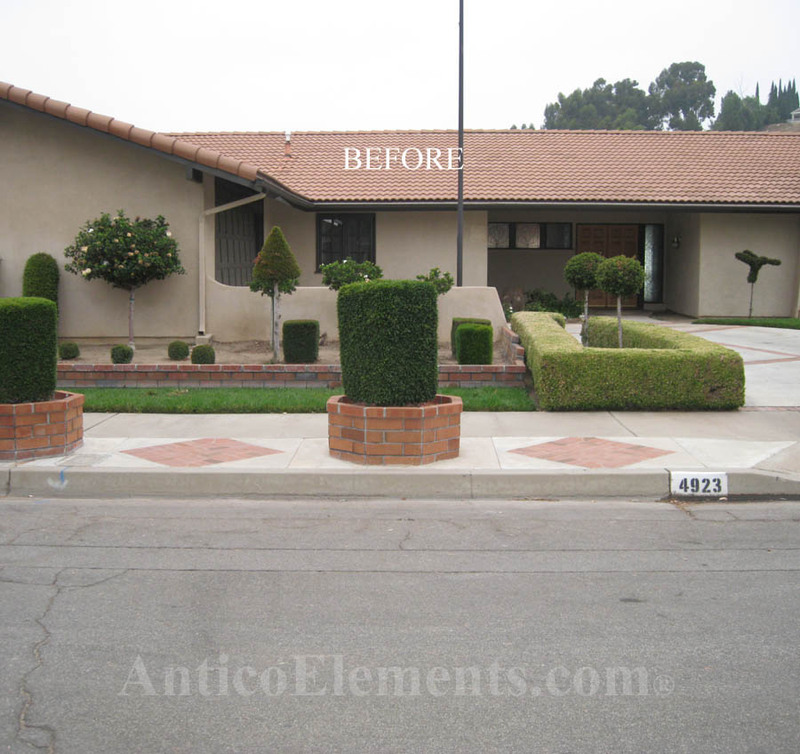 "The stones look so real, while we were in the process of putting them up a gentlemen driving by stopped and asked where we got the panels. He loved them." Nancy W. - Dearborn, MI. "We want to say again how great we think your product is. 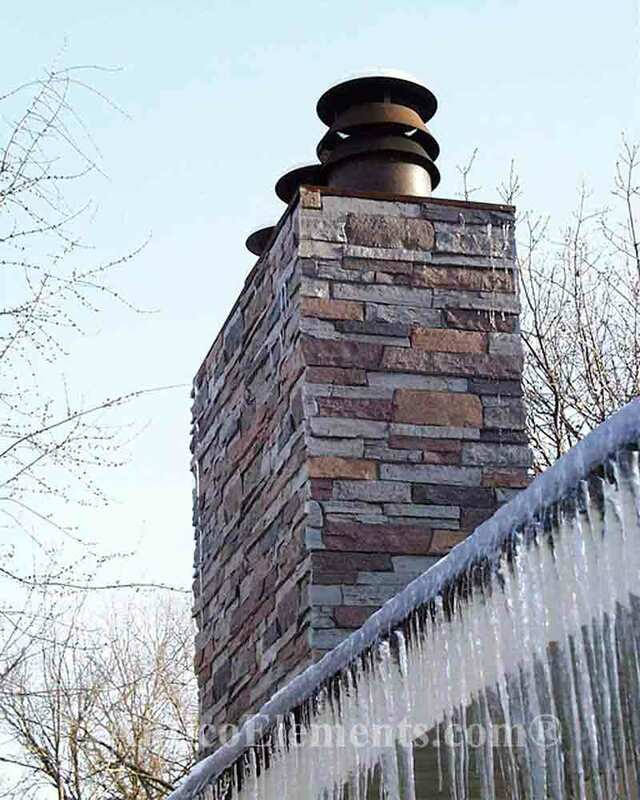 Everyone who sees it can't believe it's not real stone. 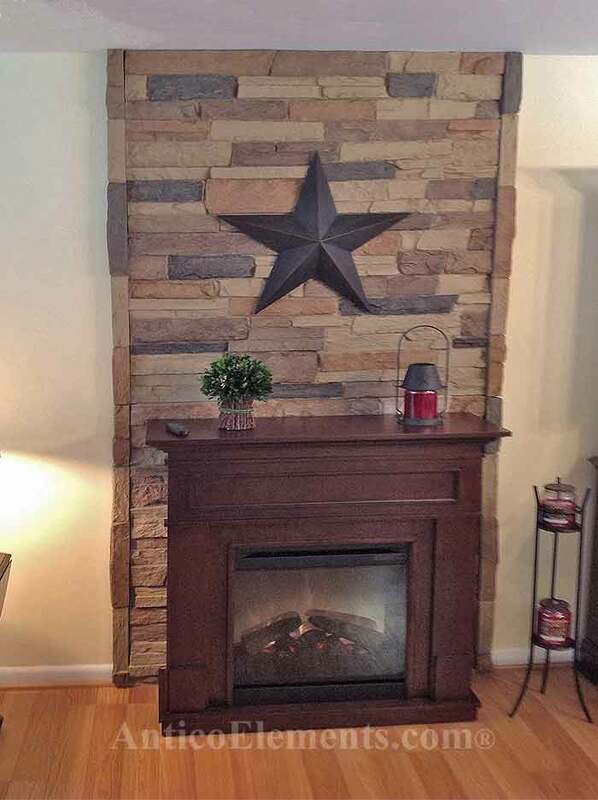 I can see how doing a wall would be super easy"
Phil & Peggy K. - Crystal Falls, MI. 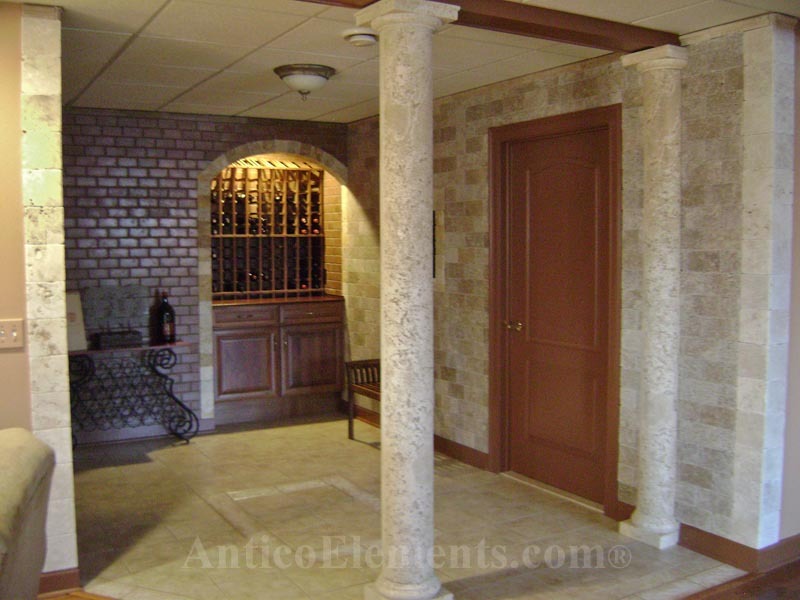 "We are very pleased with our completed wine vault. 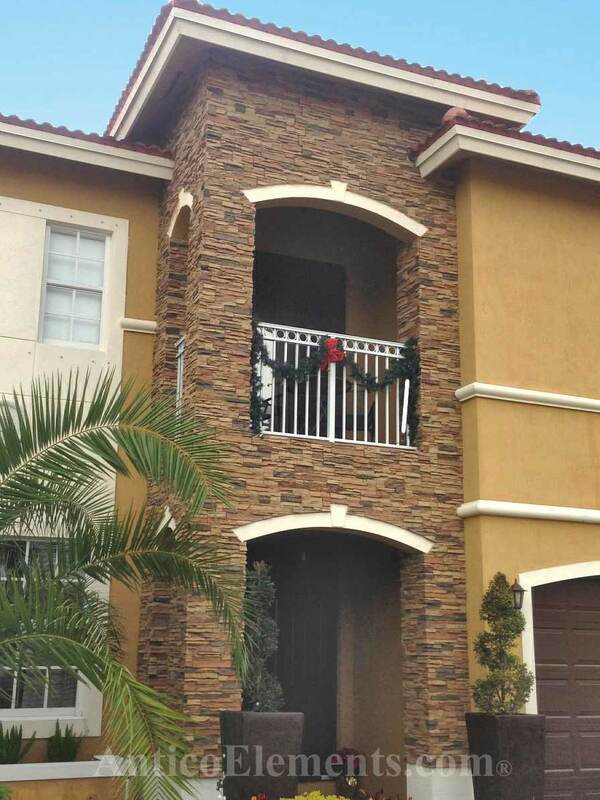 We have attached pictures of our newly installed columns." 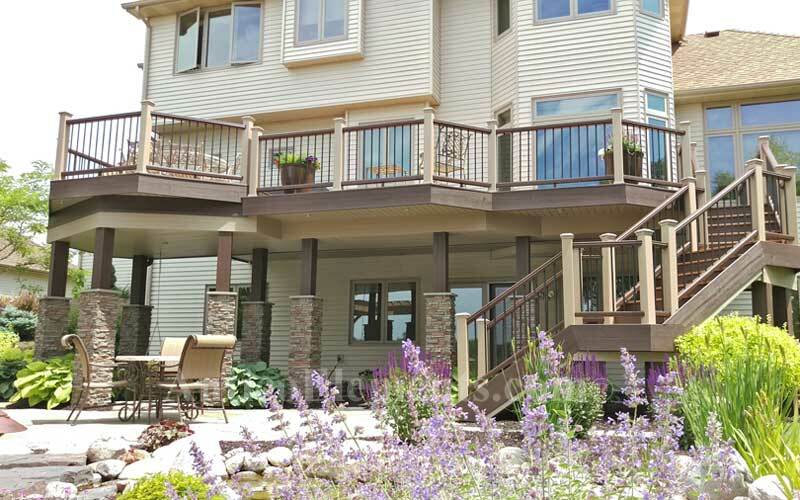 Lynn P. - Saint Charles, Il. 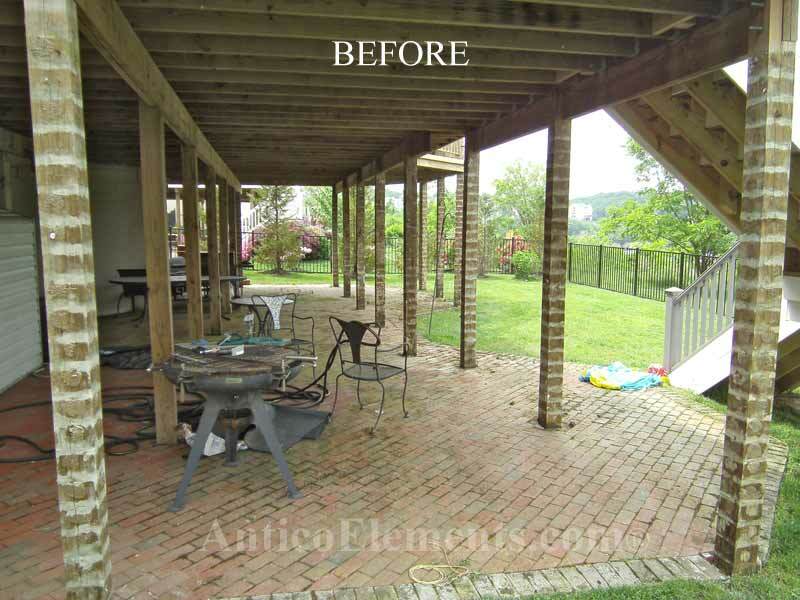 "The product was very easy to use and it looks great! 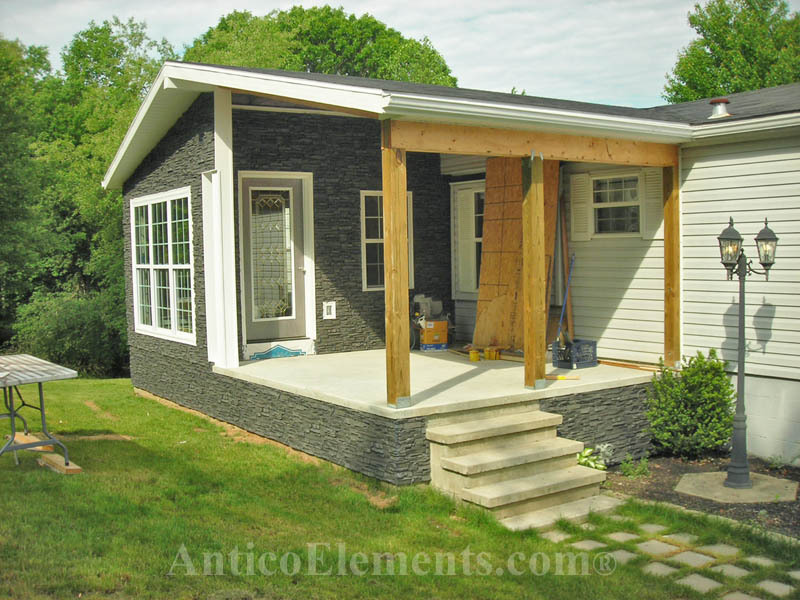 We have had many compliments since we finished it a few weeks ago. 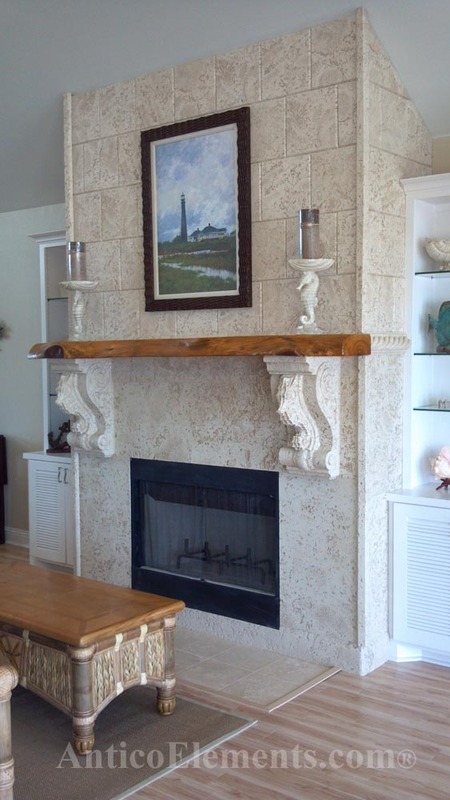 We do have one problem though: everyone wants to touch the sea horse corbels! Thank you for your help. Best regards"